2002-02-12 Assigned to SCIENTIFIC LEARNING CORPORATION reassignment SCIENTIFIC LEARNING CORPORATION ASSIGNMENT OF ASSIGNORS INTEREST (SEE DOCUMENT FOR DETAILS). Assignors: BUDRA, ELIZABETH H., DEWEY, JEFFERSON A., JENKINS, WILLIAM M., COTTLE, ELIZABETH C., DE LEY, LOGAN E., MANN, VIRGINIA A., PH.D., MILLER, STEVEN L.
2007-07-26 Assigned to SCIENTIFIC LEARNING CORPORATION reassignment SCIENTIFIC LEARNING CORPORATION RELEASE OF SECURITY INTEREST Assignors: WPV, INC.
A computer program for execution on a computing device is provided to cross-train students in language development skills such as letter-word correspondence, word recognition, vocabulary, and sentence and paragraph comprehension. 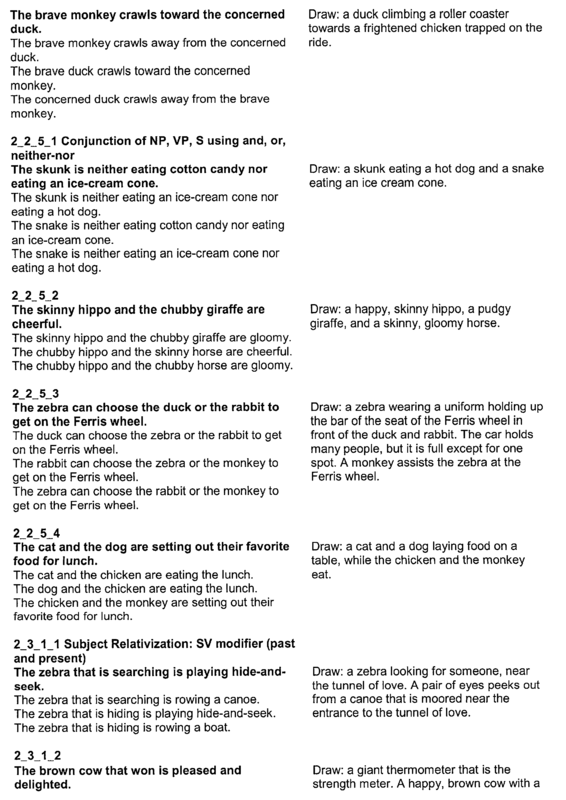 A set of programs provide an adaptive methodology for training a student in decoding (semantic, syntactic, phonological, and morphological relationships), knowledge of rhymes, synonyms, antonyms, and homophones, spelling, letter-word correspondences, sentence comprehension, grammatical comprehension, working memory, vocabulary, paragraph comprehension, and improved reading comprehension. In each program, students are presented with an animated scene that poses a question, and a set of answers. 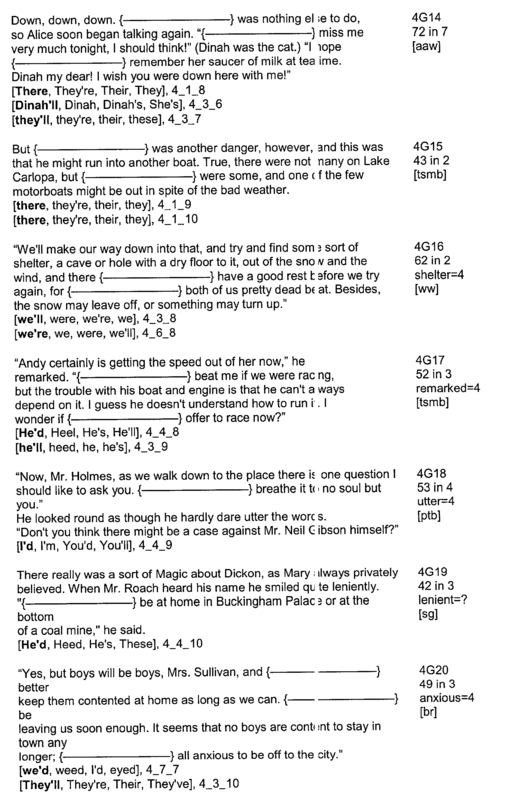 The set of answers contain a correct response, and a number of incorrect responses or foils. The student advances to more complex levels by satisfying predetermined correct thresholds. Through repetition and intensity, the student's language skills are developed. This application claims the benefit of provisional application No. 60/236,918, filed Sep. 28, 2000, and having common inventors. Other features of the present invention will become apparent upon study of the remaining portions of the specification and drawings. FIG. 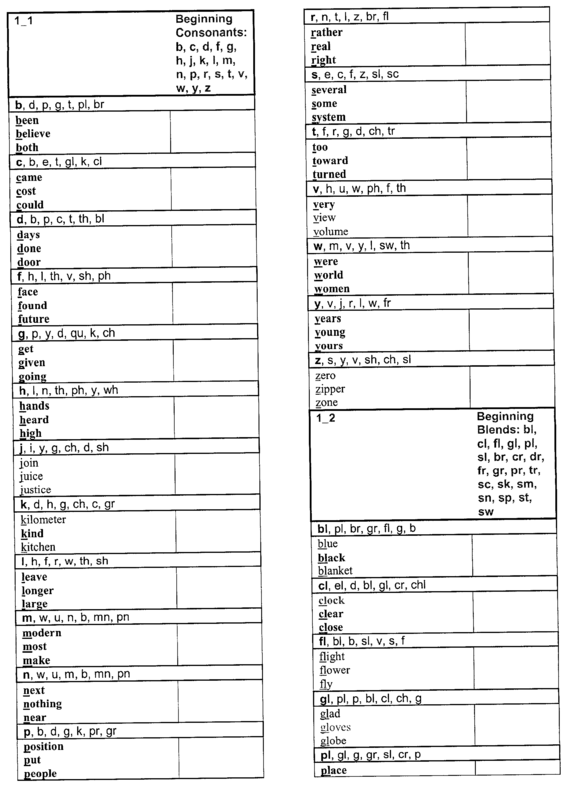 20 is a screen shot illustrating  10 matched pairs of antonyms within the game Canine Crew. FIGS. 23 a-c provide a flow chart illustrating advancement with the game Canine Crew. FIGS. 42 a-c provide a flow chart illustrating the training and advancement methodology within the game Book Monkeys. FIGS. 47 a-b are a flow chart illustrating the training and advancement methodology within the game Hog Hat Zone. Referring to FIG. 1, a computer system  100 is shown for executing a computer program according to the present invention. The computer system 100 contains a computer 102, having a CPU, memory, hard disk and CD ROM drive (not shown), attached to a monitor 104. The monitor 104 provides visual prompting and feedback to the subject during execution of the computer program. Attached to the computer 102 are a keyboard 105, speakers 106, a mouse 108, and headphones 110. The speakers 106 and the headphones 110 provide auditory prompting and feedback to the subject during execution of the computer program. The mouse 108 allows the subject to navigate through the computer program according to the present invention, and to select particular responses after visual or auditory prompting by the computer program. The keyboard 105 allows an instructor to enter alpha numeric information about the subject into the computer 102. Although a number of different computer platforms are applicable to the present invention, embodiments of the present invention execute on either IBM compatible computers or Macintosh computers. Referring now to FIG. 2, a login screen  200 is shown allowing a user to enter into the Fast ForWord Reading program. A login such as this is important for several reasons. First, it insures that only licensed students obtain the training provided by the Reading games. Second, it allows the software to act as a client, in a client-server architecture, specifically to allow the client to communicate game progress for each student back to the server. 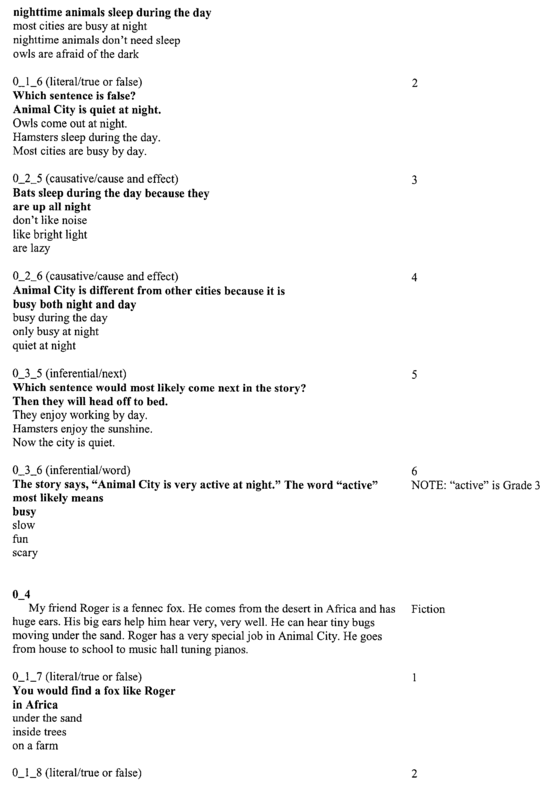 This provides an important progress reporting function that is desirable to the student. In addition, it provides significant heuristic information relating to each trial, and the success of the training methodology of each game back to the developer, so that further advancements can be made. Once the student enters their username and password, they are taken to the main program selection screen  300 of FIG. 3 to which attention is now directed. Screen 300 shows six games that are to be played within Fast ForWord Reading: 1) Scrap Cat; 2) Canine Crew; 3) Chicken Dog; 4) Twisted Pictures; 5) Book Monkeys; and 6) Hog Hat Zone. The student begins training in one of the games by selecting the name of the game on the screen 300. One skilled in the art will appreciate that an alternative methodology would allow a trainer, or a supervisor, to particularly specify the games to be played, and the order in which they are to be played. By providing multiple games, each of which train on different aspects important in language learning and comprehension, a student will be cross trained in a number of areas important in becoming an efficient reader. 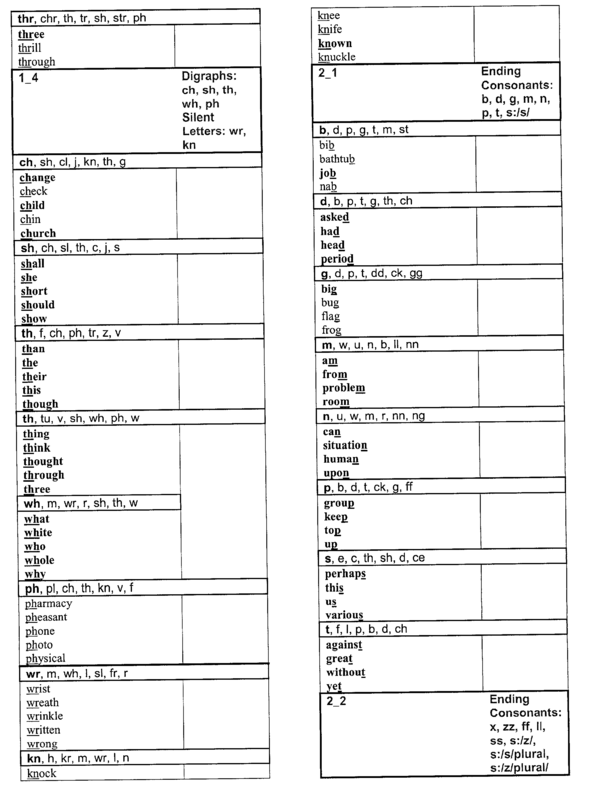 Once the reader successfully links letters and letter sequences to their underlying phonological structures, word recognition becomes largely automatic and the student can comprehend familiar words without consciously analyzing their phonological properties. However, even very skilled readers will use phonological properties to decode a word they have never seen before. 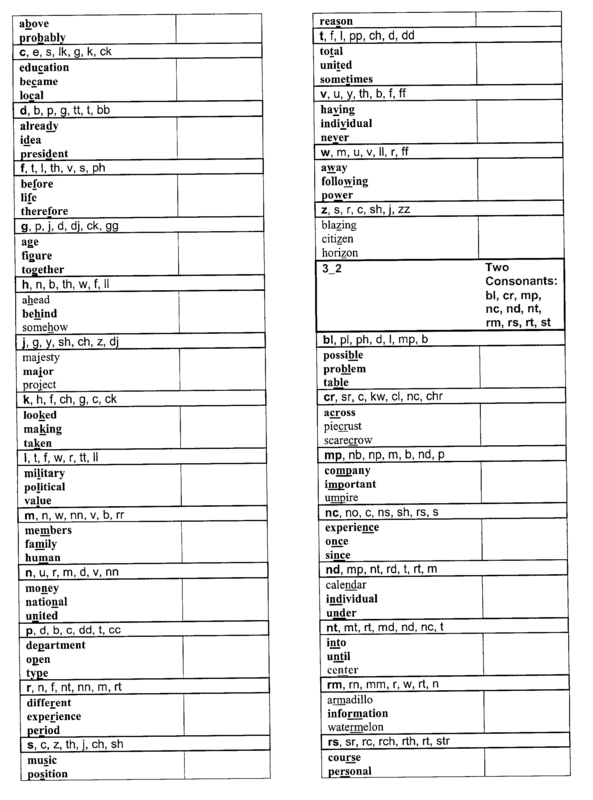 For example, how could you read the nonsense word atishnet if you didn't use the phonological properties of the word? In addition, the student's vocabulary in 3 rd grade and beyond is expanded primarily through adding morphemes to already known root words. As the student progresses, he or she relies more and more on analyzing morphological components in order to decode new words. With the above background on Scrap Cat, the reader's attention is now directed to FIG. 4 which provides a screen shot  400 illustrating an initial scene for the game. The setting for the game is a junkyard. When the game begins, the student is presented with an empty garbage bin 402, a number of recycling containers 404, a recycling chute 406, and a character 408 entitled “Scrap Cat”. Scrap Cat 408 is standing on a barrel 410 that contains a counter 412. In the upper right hand corner of the scene 400 is a time indicator 414 that provides the student with a relative indication of the time remaining for training. On Scrap Cat's  408 shirt is a paw 416. The student begins training by placing a cursor (moved by a computing input device such as a mouse) over the paw 416 and selecting the paw 416 (by clicking the mouse, for example). When the student has indicated selection of the paw 416, a bottle or can rolls down the recycling chute 406 and displays a word. The student must figure out which category the word fits into, and then select (by mouse click, for example) that category's recycling container 404. Referring now to FIG. 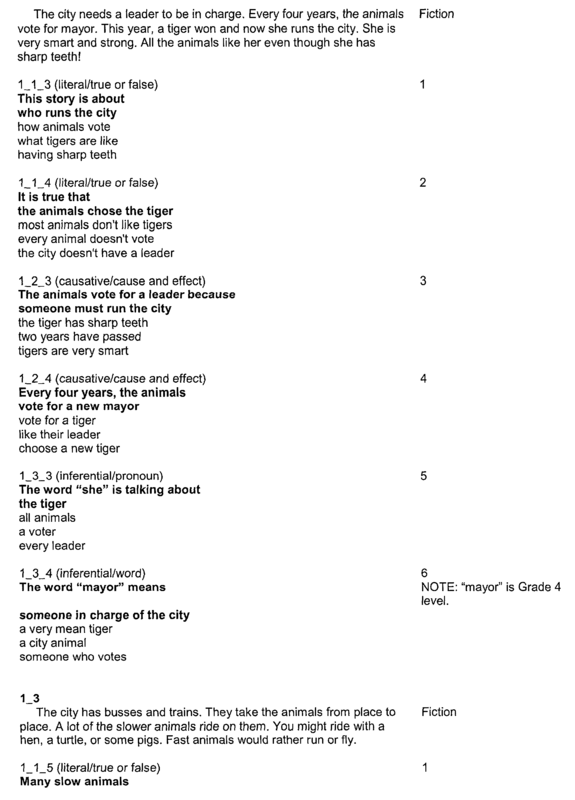 5, a screen shot  500 is shown, illustrating a first trial (presented after the student selected the paw 416). Like elements have like references, the hundreds digit being replaced by a “5”. The garbage bin 502 is first filled with garbage 520, and then a first word 522 is presented on a rolling can or bottle at the bottom of the recycling chute 506. At first, the student is provided with just two categories into which the word 522 must be sorted. 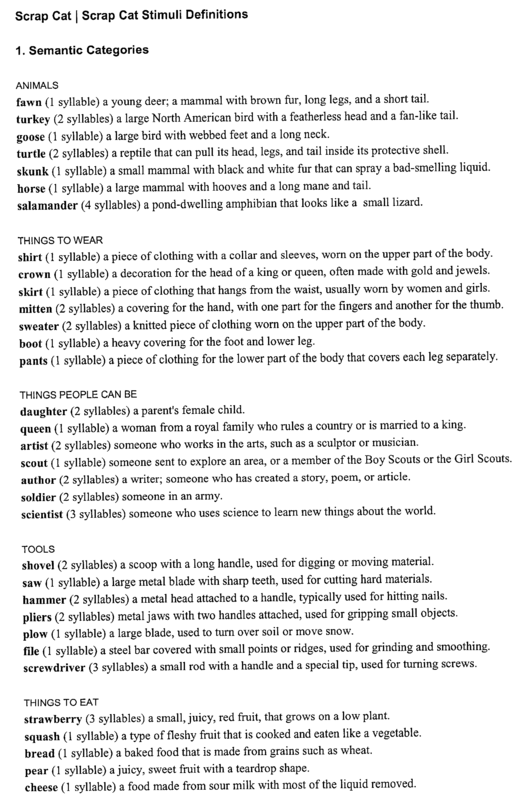 In this example, the word 522 fawn must be sorted into one of the categories: “things to wear” 524; or “Animals” 526. 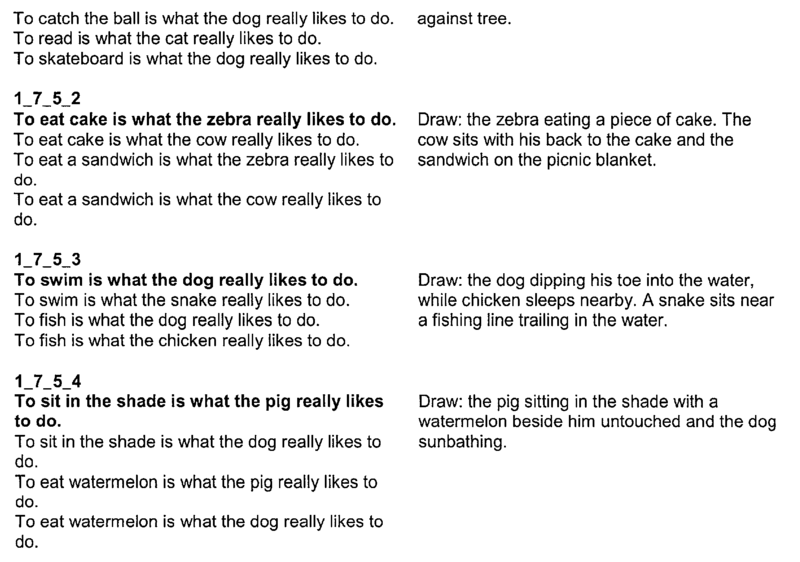 For the first trial, the correct category (e.g., Animals) is highlighted to indicate to the student that they are to select Animals. Upon successful selection of the category Animals, a crusher 540 crushes the word fawn 522 and sorts it into the recycling bin 504 associated with Animals. Referring now to FIG. 6, a screen shot  600 is provided illustrating presentation of a second word, skirt 622. This word is automatically presented after completion of the first trial. The student must correctly select the category associated with the recycling containers 604. If the student doesn't understand a word, the student can look up the definition by clicking the ? button 518 at the bottom of the recycling chute 506 (see FIG. 5). 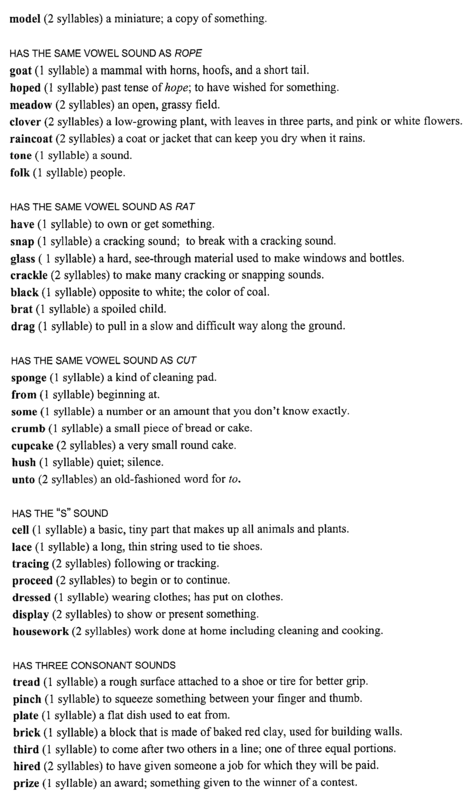 Scrap Cat 608 then presents the word and the number of syllables along with a short definition, as shown in box 628. If the student doesn't understand a category in one of the recycling containers 404, the student can click a speaker 630 next to each recycling container 604 to hear the category name read aloud. Referring now to FIG. 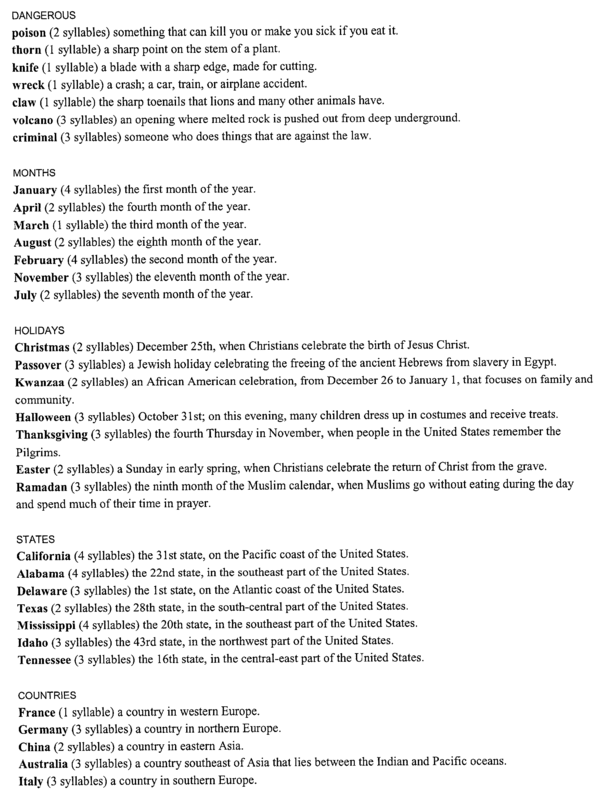 7, a screen shot  700 is shown presenting a word “turkey” 722 for categorization. The student must correctly categorize the word 722 into one of two categories “things to wear” 724 or “Animals” 726. 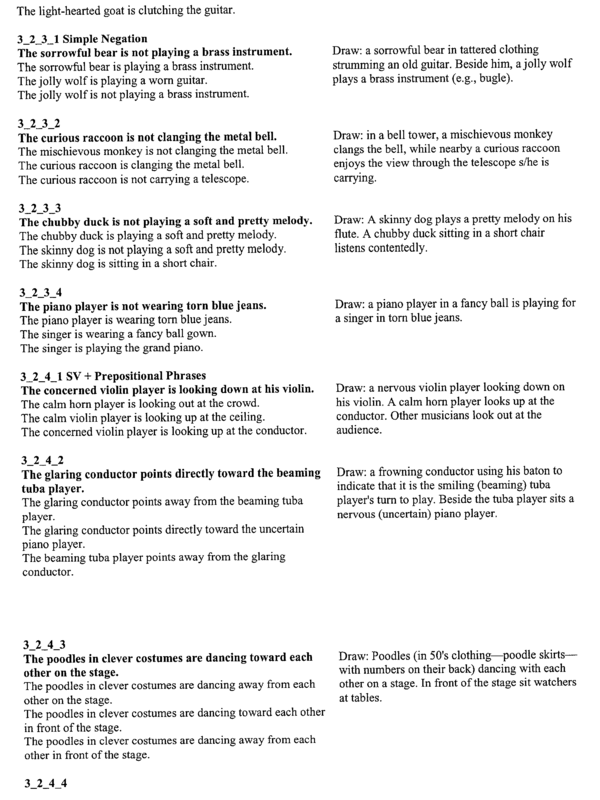 Upon correct selection of the category “Animals” 726, the category is highlighted to indicate correct selection, and the sound of a bell (e.g., “ding”) is played to indicate correct selection. 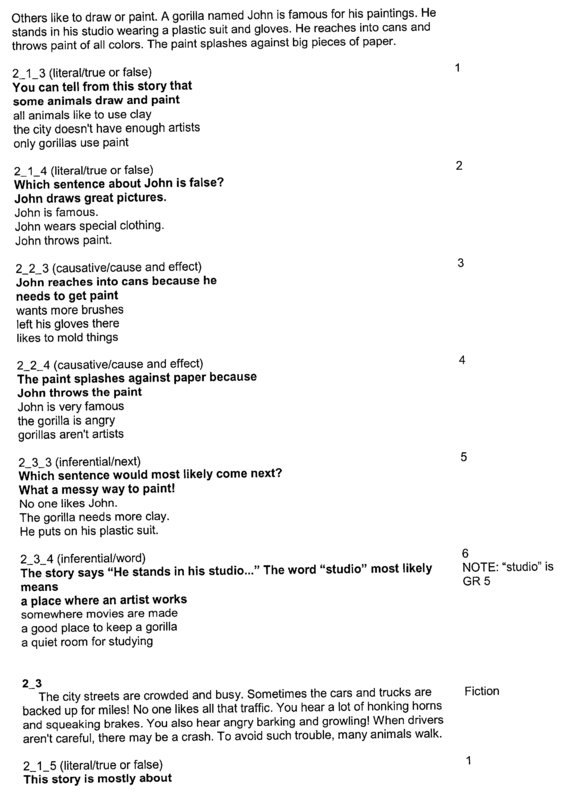 If the student makes an incorrect selection, a “thunk” is played, and the correct category is highlighted. Referring now to FIG. 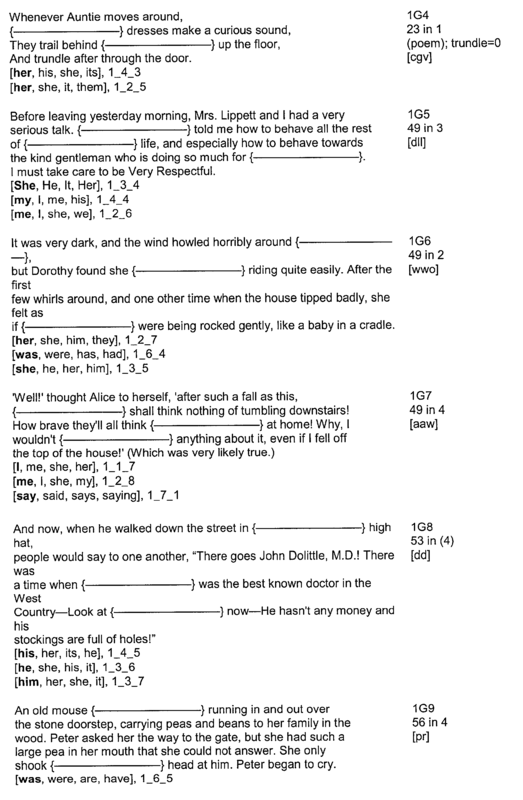 8, a screen shot  800 is shown illustrating an animation occurring after correct categorization of a word. A crusher 840 drops down and crushes the word, and then shoots the crushed word 822 into the recycling bin 804 associated with the correct category 826. Alternatively, if the student selects an incorrect category for the word 822, after the “thunk” is played, the word simply drops off the recycling chute 806. After several trials, the score counter  812 advances to indicate correct categorizations, and the student is required to select the paw 816 for more trials. The number of trials for each category level was provided above in Table 1. Referring now to FIG. 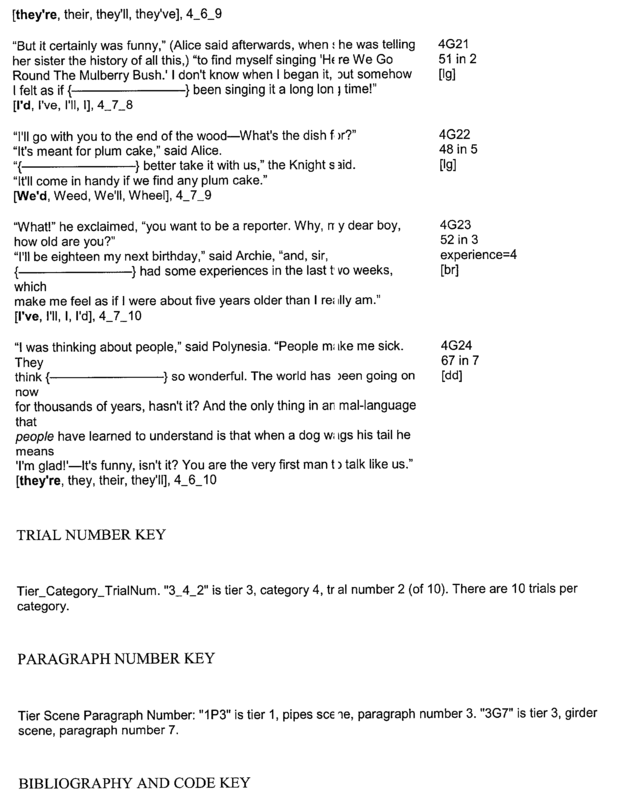 9, a screen shot  900 is shown illustrating a word 916 that must be categorized into one of three categories 924, 926, or 932. 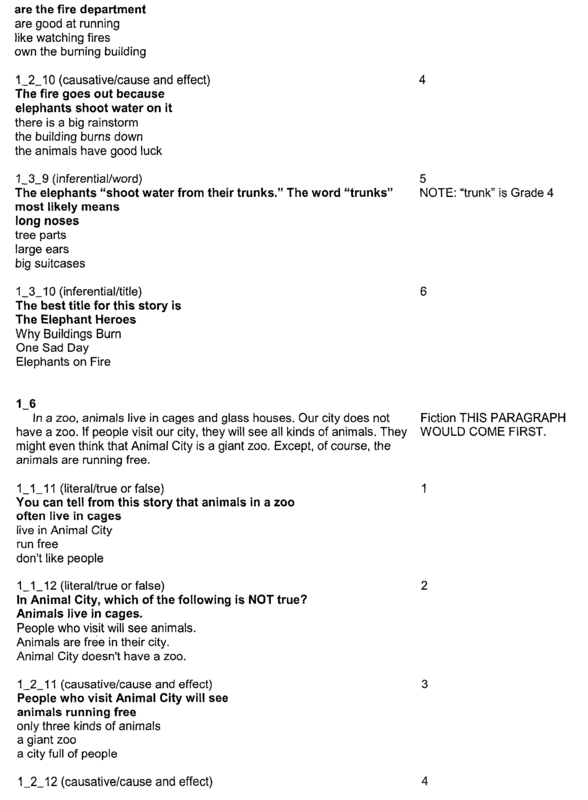 In this screen shot, the student incorrectly selected the category “Animals” 932 to correspond to the word “crown” 916 (indicated by the highlighted box 932). A “thunk” is played, and the correct category “things to wear” 926 is subsequently highlighted. Referring now to FIG. 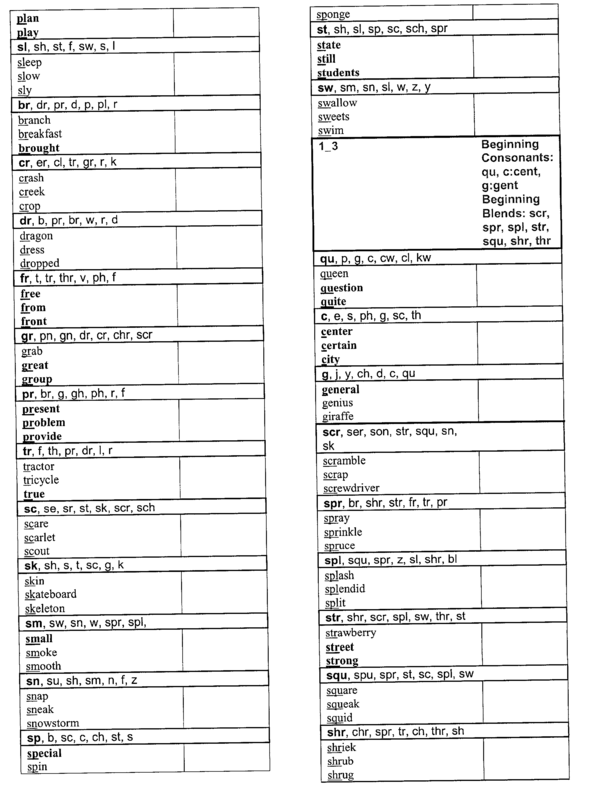 10, a screen shot  1000 is shown illustrating a word “hammer” 1016 that must be categorized into one of four categories 1024, 1026, 1032, or 1034. 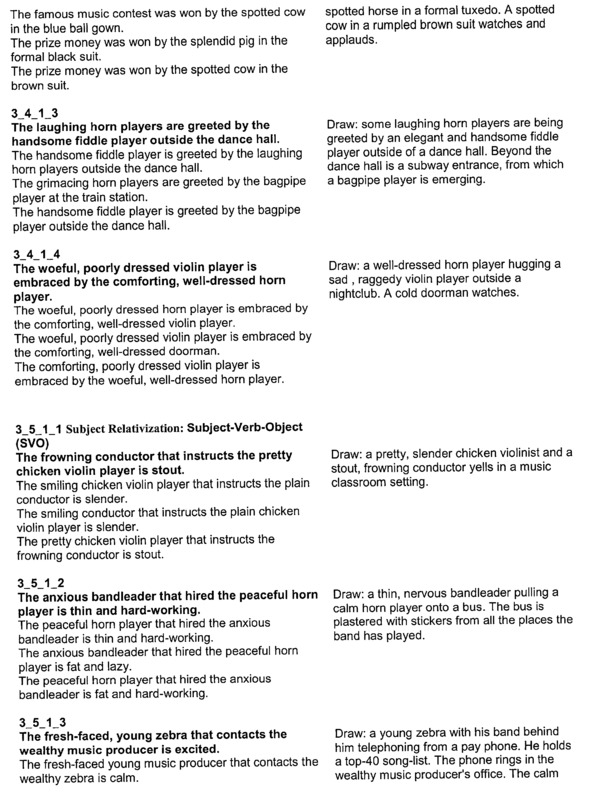 The student has progressed to playing in four categories by correct categorization as described above with reference to Table 1. Referring now to FIG. 11, a screen shot  1100 is shown illustrating a reward animation, in this case a mouse 1136 hopping across the screen in a jumping boot 1138. Reward animations similar to this are presented at regular intervals to entertain the student and keep them interested in continued training. Referring now to FIG. 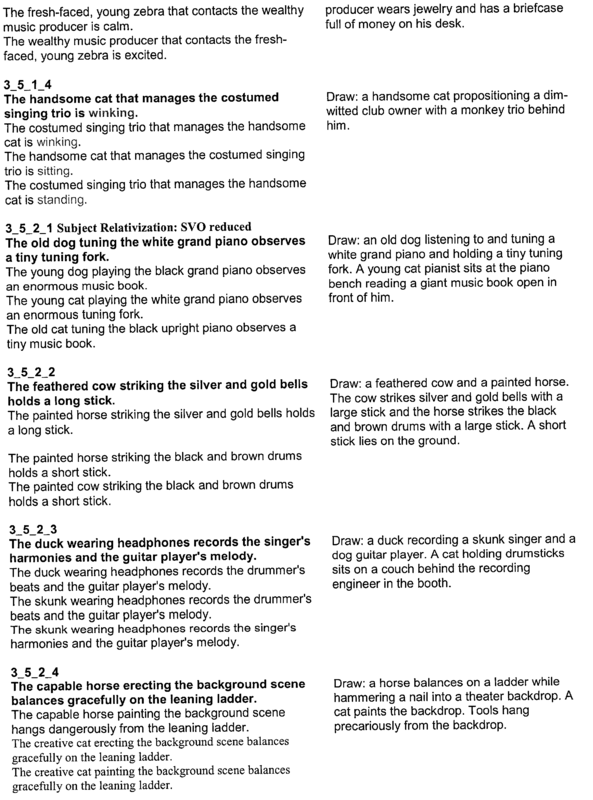 12, a screen shot  1200 is shown illustrating a trial within one of the morphological categories. In this trial, the student is presented with a word “ordered” 1216 and is required to place the word into one of the four categories 1224, 1226, 1232, or 1234. In this instance, the student correctly selects the category 1232 “Has a suffix that means “happened in the past”” as indicated by the highlight. Referring now to FIG. 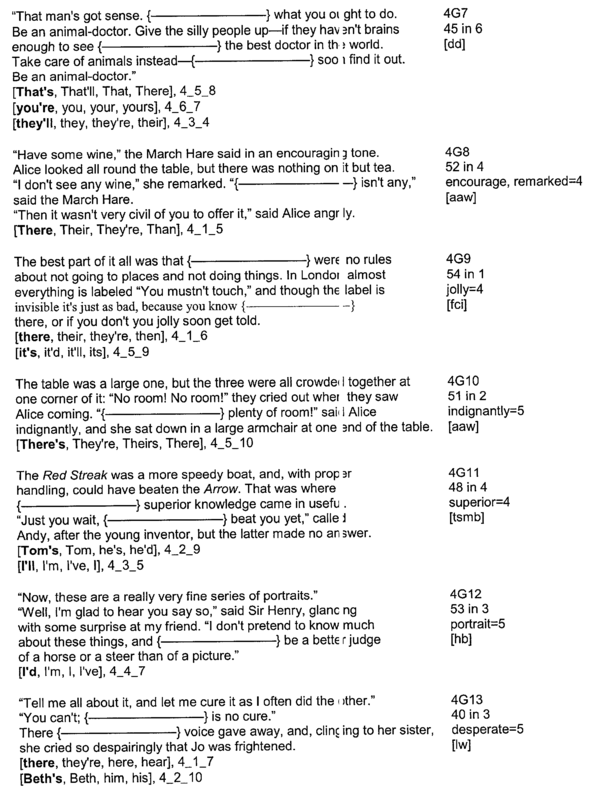 13, a screen shot  1300 is shown illustrating that after correct selection of the category 1332 for the word “ordered” 1316, before the word is crushed by the crusher 1324, the word particularly highlights the suffix “ed” for the correct categorization. One skilled in the art will appreciate that other suffixes/prefixes as applicable are highlighted before being disposed of in the proper recycle bin. Referring now to FIG. 14, a flow chart  1400 is provided particularly illustrating the progress flow for the game Scrap Cat. When reference is required to the screen image for the game, reference will be made back to elements in FIG. 4. The game starts at block 1402 and proceeds to block 1404. At block  1404 there is no trash in the bin 402 and no categories in the recycle bins 404. Flow proceeds to block 1408. If the student selects “Exit”, or if a predefined time period for game play expires, flow proceeds to block 1406 where the game Scrap Cat ends, taking the student back to the main program screen as described above. At block  1408, the next trial begins. 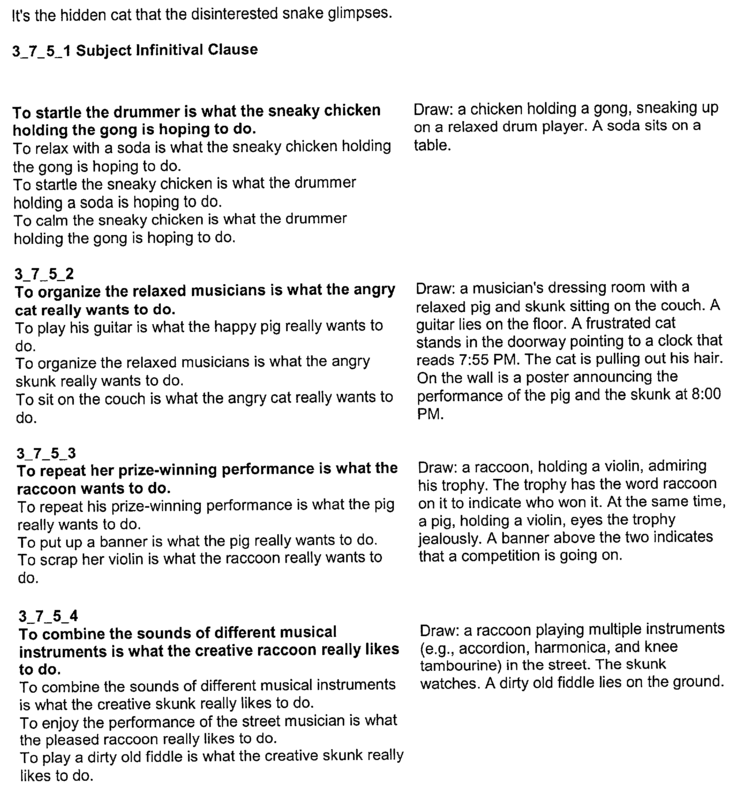 The trial begins with the program selecting a category type (e.g., Semantic, Syntactic, Phonological, Morphological), two or more categories (e.g., Animals, Things to Wear), and a word from one of the selected categories (e.g., fawn) to be presented to the student. Flow then proceeds to block 1410. At block  1410, the selected (two, three, or four) categories appear on the recycle bins 404 (in random placement). Flow then proceeds to block 1412. At block  1412, a container rolls out of the garbage bin 402, down the chute 406, and the selected word appears on the container. At this point, the system waits for the student to indicate which of the categories the selected word should be placed in. If the student selects one of the provided categories (on the bins 404), flow proceeds to decision block 1414. If the student requires assistance with the selected word, s/he may click on the “?” box below the chute 406. If s/he does, then flow proceeds to block 1416. At block  1416, a definition of the selected word appears below the chute 406, as illustrated in FIG. 6. At this point, the student may understand the word enough to attempt a categorization, and if s/he selects one of the provided categories, flow proceeds to decision block 1414. Alternatively, the student may wish to hear the selected word. If so, the student can click on the horn 628, in which case flow proceeds to block 1418. At block  1418, the selected word is aurally presented by the computing system so that the student can hear the word that is to be categorized. Flow then returns back to block 1416. Flow reaches decision block  1414 when one of the categories is clicked. A determination is made as to whether the correct category for the word has been selected. If so, flow proceeds to block 1420. If an incorrect categorization is made, flow proceeds to block 1426. At block  1420, a “ding” is played, indicating to the student that a correct categorization has been made. In addition, the selected category is highlighted to further emphasize the correct selection. Flow then proceeds to blocks 1422/1424. At blocks  1422/1424, points are added to the student's score. More specifically, if the student did not press the “?” box 518 to see a definition of the word, the student's score is incremented by four points. Alternatively, if the student did press the “?” box 518 to see a definition of the word, the student's score is incremented by one point. In either case, flow proceeds to block 1428. At block  1428, the result of the instant trial is recorded. That is, the program records the categories being tested, the number of categories being tested, the word tested, whether the student required the word to be defined/played, and whether the student correctly or incorrectly categorized the word. Flow then proceeds to block 1430. Flow to block  1426 indicates that the student incorrectly categorized the word. At this point, a “thunk” is played indicating to the student that s/he incorrectly categorized the word. In addition, the correct category is highlighted to emphasize to the student the correct categorization. Flow then proceeds to block 1428 where the result of the trial is recorded. At block  1430, another trial is selected according to the advancement strategy further described with respect to FIG. 15 below. Referring now to FIG. 15, a flow chart  1500 is provided to particularly illustrate how trials are selected, and how a student advances play for the game Scrap Cat. Flow begins at block 1502 and proceeds to block 1504. 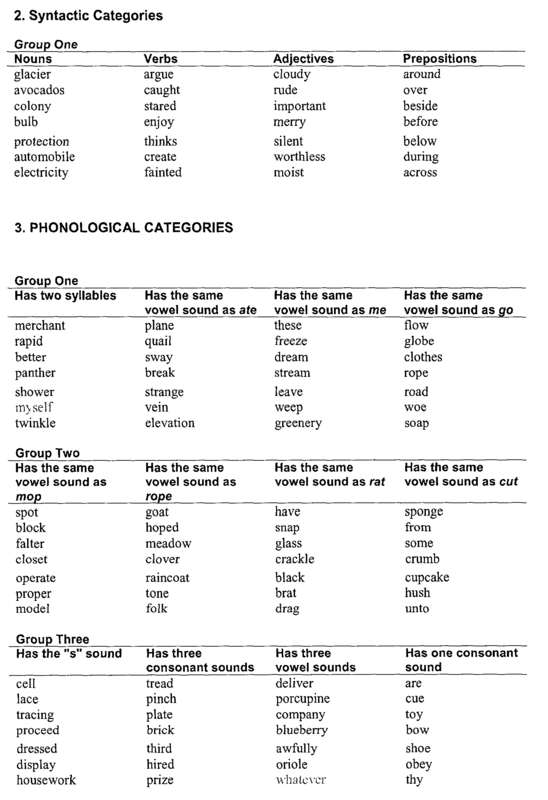 As mentioned above, the student will ultimately progress through the four category types: Semantic; Syntactic; Phonological; and Morphological. 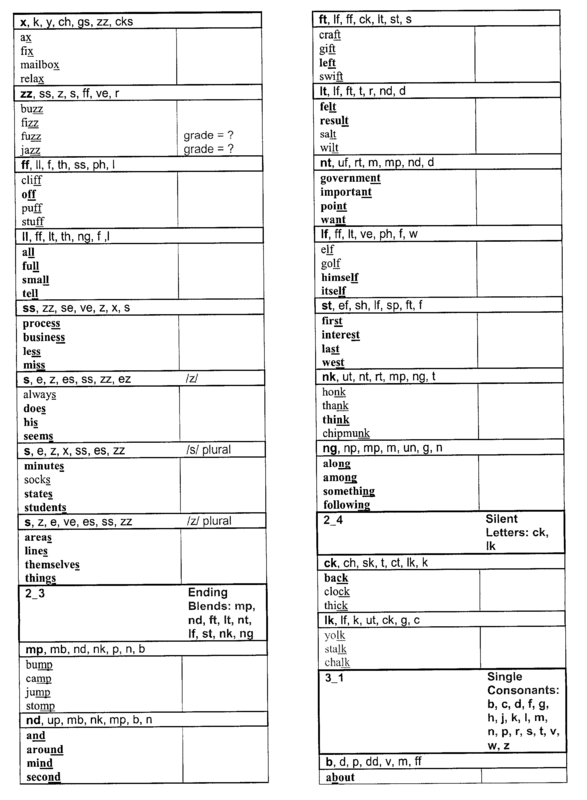 More specifically, a student will advance through progressively larger numbers of words in progressively more categories (as shown in Table 1 above). At block  1504, a category type is selected. If no testing has taken place, the first category type selected is Semantic. Flow then proceeds to decision block 1508. At decision block  1508 a determination is made as to whether there are any groups are available within the selected category type. If not, flow proceeds back to block 1504 where another category type is selected (e.g., syntactic). If groups are available within the selected category type, flow proceeds to block 1506. At block  1506, a category group is selected. Flow proceeds to block 1510. At block  1510, a category is selected, then words for the selected category is selected. Flow then proceeds to block 1512. At block  1512, the trial is presented. Flow then proceeds to decision block 1514. At decision block  1514, a determination is made as to whether there are any more words to present for the selected category. If there are, flow proceeds back to block 1512 where the additional words are presented. Otherwise, flow proceeds to decision block 1518. At decision block  1518, a determination is made as to whether the student has correctly categorized at least 90% of the trials within the selected groups. If ten or less words have been tested, the student is allowed to miss just one of the trials. If less than six words have been tested (for two categories), or if the student has correctly responded to 90% of the trials within a selected category group, flow proceeds to decision block 1522. Otherwise, flow proceeds to decision block 1520. 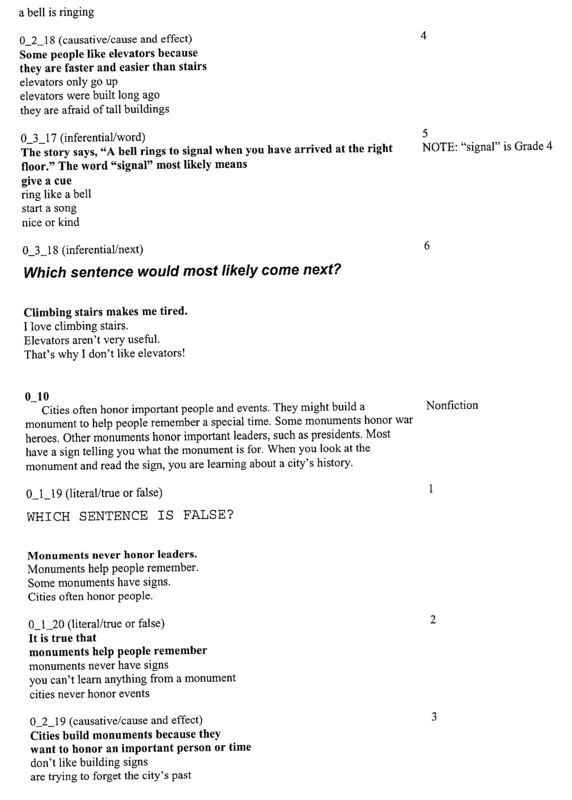 At decision block  1522, a determination is made as to whether the student has been tested in 20 words in all four categories of a category type. If so, flow proceeds back to decision block 1508. If not, flow proceeds back to block 1510 where categories/words are selected. At decision block  1520, a determination is made as to whether the present group has been repeated 3 times. If so, the flow proceeds back to decision block 1508. Otherwise, flow proceeds to block 1516. The student reaches decision block  1520 when they have not achieved 90 percent correct response within a given selection of category groups within a selected category type. A test is made to determine whether the student has three times repeated the present group selection, within the selected category type. If not, flow proceeds to block 1516 where testing in the present group continues. However, if the student has repeated the present group three times, the student is considered to have “plateaued”. That is, the student has been unable to achieve 90% correct response to trials within a selected group within a selected category type. In this instance, the category group selection within the present category type is changed. Flow then proceeds to block 1508 for continued testing within alternative category groups within the present category type. 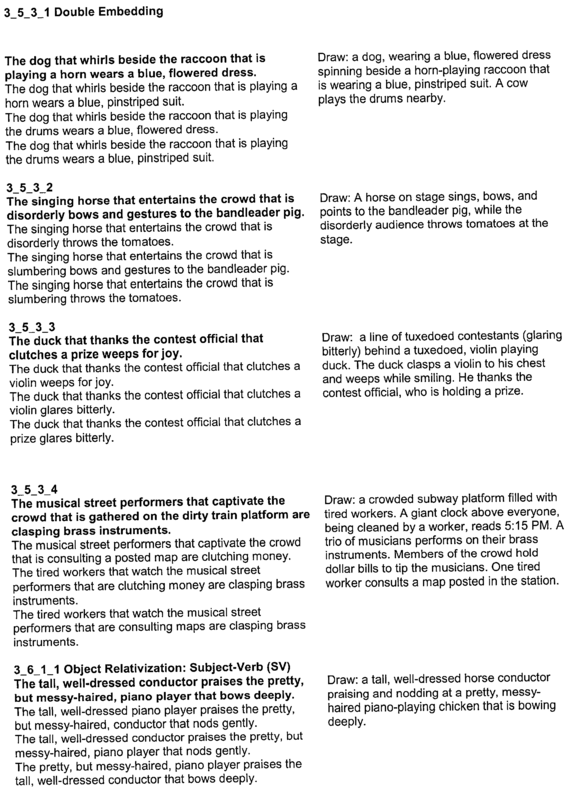 At block  1516, the words and categories are repeated for the present group. Flow proceeds to block 1512. 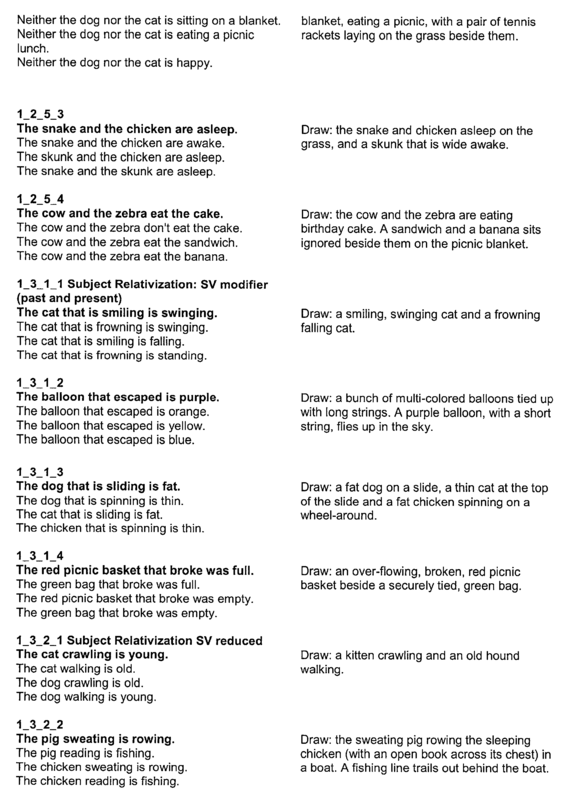 The above discussion has described the methodology for the game Scrap Cat according to the present invention. An animated scene  1600 is presented of a street whose traffic has been stopped by a hairy street worker 1602 that is repairing a pothole 1604. Students who play the game help the street worker 1602 to fill the pothole 1604 by matching similar words and filling the pothole with word bricks. Also shown in the scene 1600 is a score counter 1606 for accumulating a student's score and a timer 1608 indicating a relative amount of time remaining for game play. Referring now to FIG. 17, a scene  1700 is shown for the game Canine Crew. When the student clicks on the yellow paw 1710, a steam shovel (not shown) drops a brickload of words 1712 above the pothole 1704. 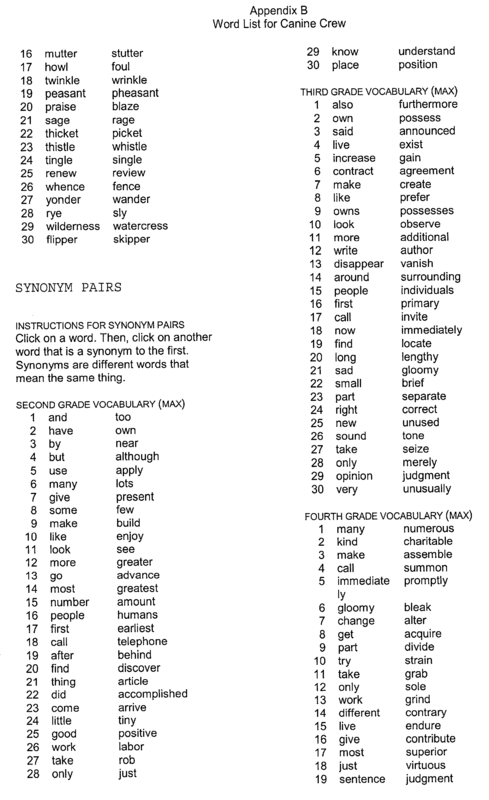 The student must pair the words according to the category that is being trained. 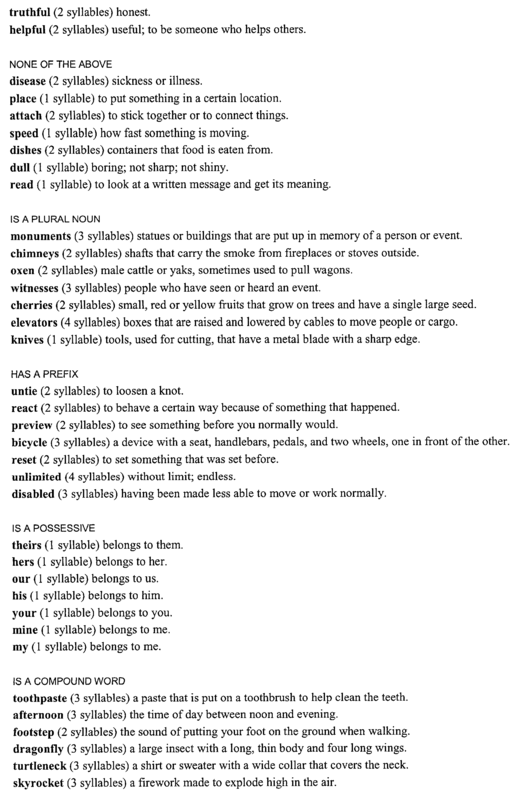 In one embodiment, the first category being trained is rhyme. 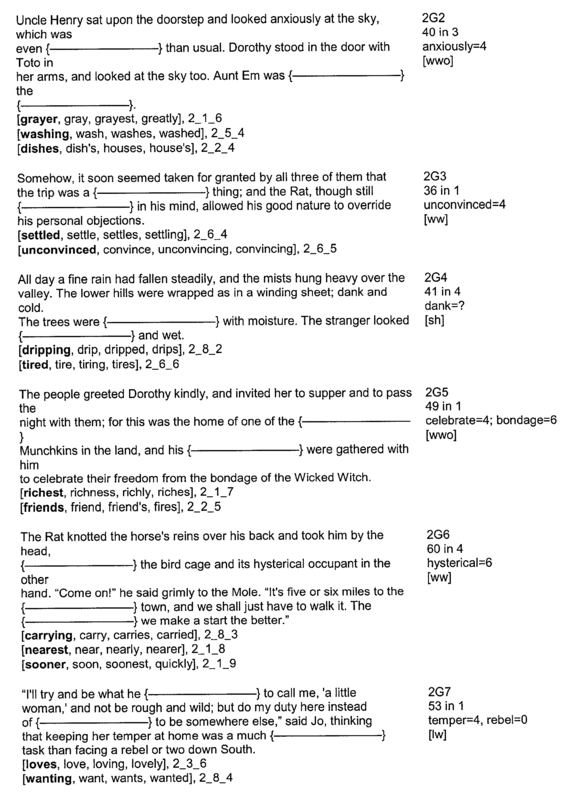 Initially, the student is provided with a brickload 1712 of seven words including three matching pairs, and one foil (the foil is provided to increase the difficulty of the task). When training in this category, the student clicks a first word, and then clicks a second word that rhymes with the first word. This is particularly illustrated in FIG. 17. That is, the student has first clicked the word “deal” 1714. The only word shown that rhymes with “deal” is the word “peel” 1716. When the student places a selection cursor (not shown) over the word “peel” 1716, the word is highlighted. 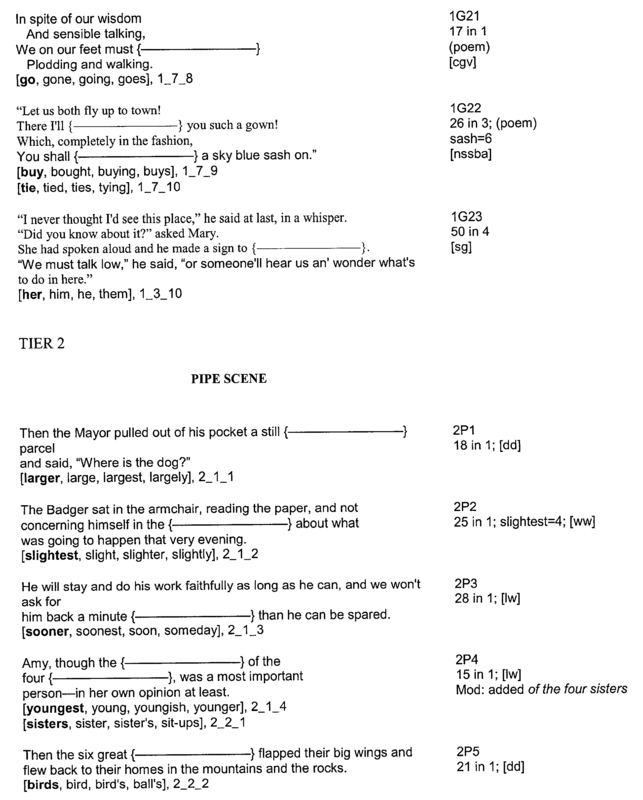 When the student selects the word “peel” 1716, a “ding” is played by the computing device indicating to the student that s/he has correctly selected a rhyme for the word “deal”. At this point, both words “deal” 1714 and “peel” 1716 fall into the pothole 1704, and are thus removed from the set of brickwords 1712. The student continues pairing the remaining words until the last pair has been matched, and the pothole 1704 is filled. 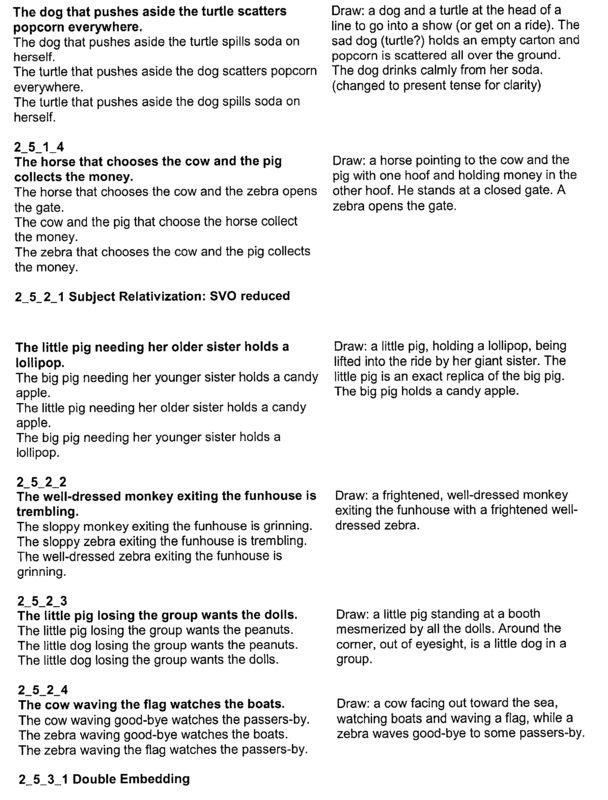 If the student selects a first word, and then incorrectly pairs it with a second word, the student is aurally presented with a “thunk” indicating an incorrect selection, and the first word is “un-highlighted”, thereby allowing the student to re-select a first word for pairing. 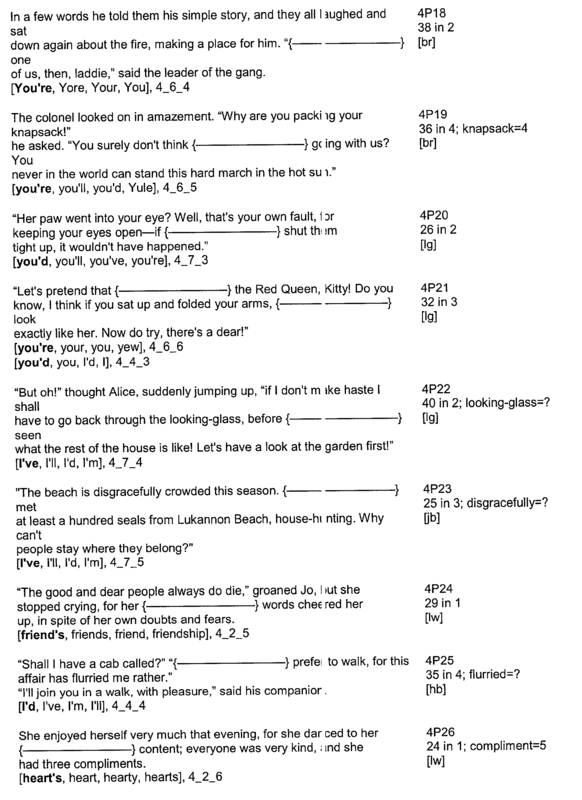 As the student progresses in his/her training, the number of words provided in the brickword load  1712 increases, as does the complexity of the vocabulary. 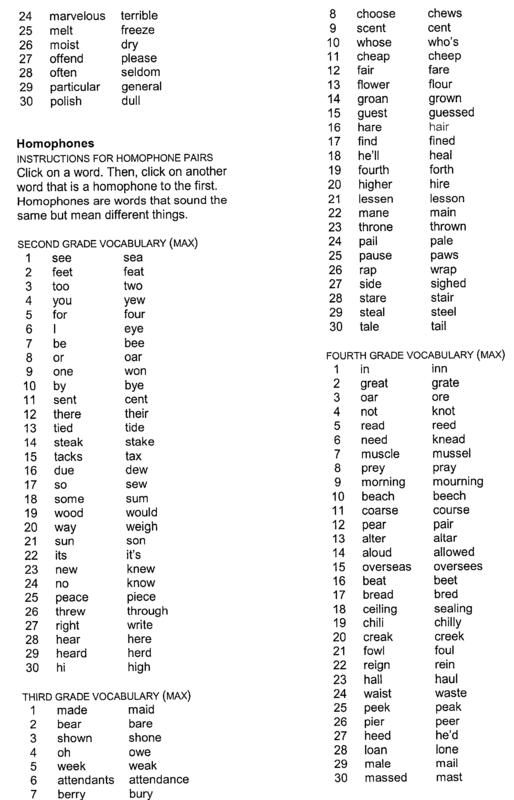 In addition, as the student correctly progresses in pairing words, s/he is moved through four semantic and phonological categories, one by one as follows: 1) Rhymes; 2) Synonyms; 3) Antonyms; and 4) Homophones. Referring now to FIG. 18, a screen shot  1800 is shown illustrating a steam shovel 1820 dropping another brickload of words 1812 for the next trial. In one embodiment, the brickload 1812 is dropped after the student completes a previous trial, and selects the yellow paw 1810. Referring now to FIG. 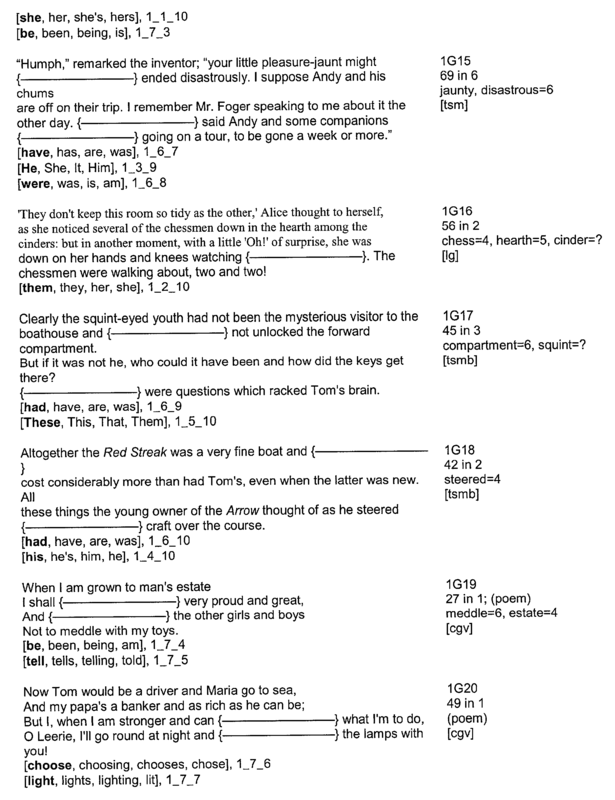 19, a screen shot  1900 is provided of another rhyming trial. In this instance, one skilled in the art will appreciate that the number of bricks 1912 that are presented in the trial has increased over the trial illustrated in FIG. 1700 (as has the size of the pothole 1904!) As in FIG. 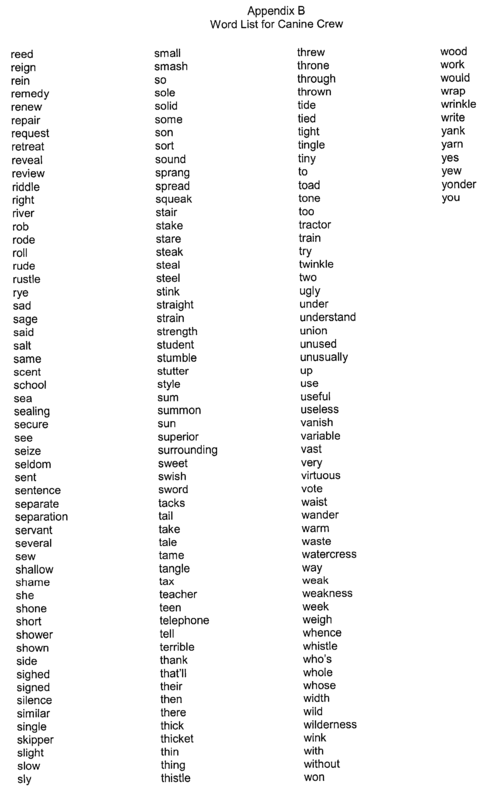 1700, the student must pair the rhyming words to fill the pothole 1904. Referring now to FIG. 20, a screen shot  2000 is shown illustrating a large number of brick words 2012 that must be paired. In this instance however, the words that must be paired are not rhymes of each other. 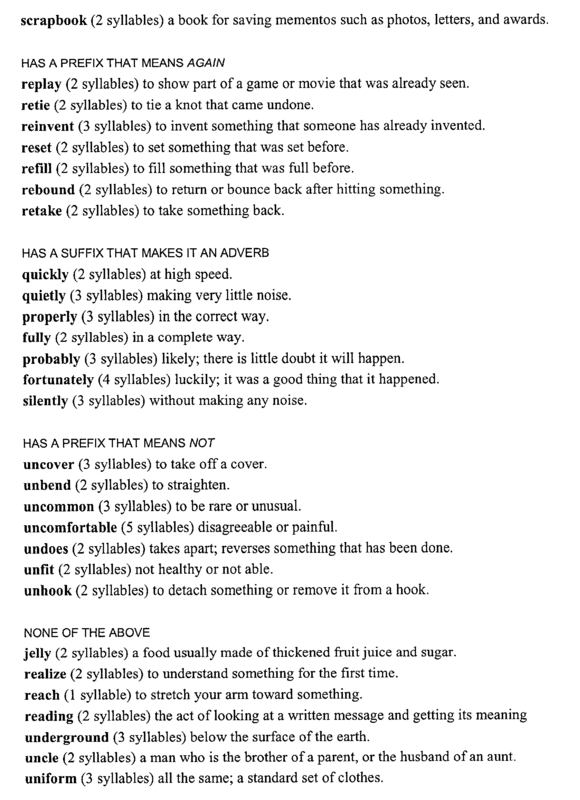 Rather, they are antonyms (i.e., words that mean the opposite of each other). Referring now to FIG. 21, a screen shot  2100 is shown illustrating a number of brick words 2112 that must be paired. 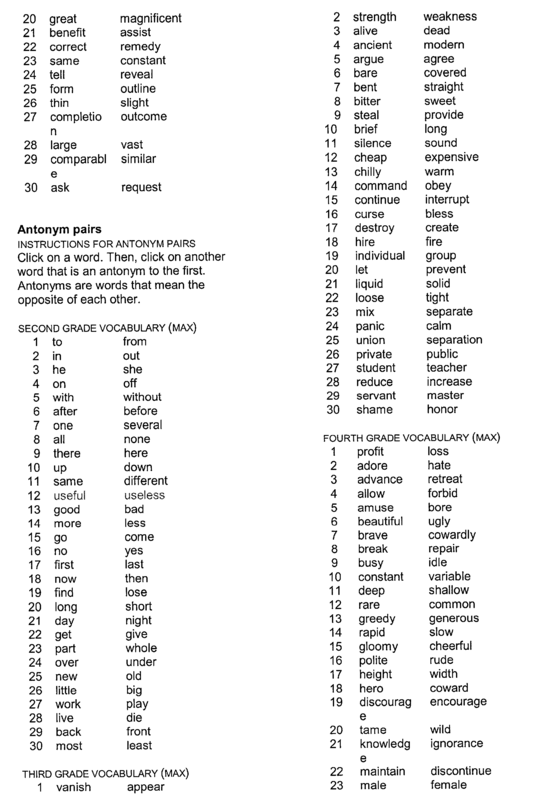 In this instance however, the words that must be paired are not antonyms of each other. Rather, they are homophones (i.e., words that sound alike though spelled differently). Referring now to FIG. 22, a screen shot  2200 is shown illustrating a reward animation that is played for the student. A number of different reward animations are provided to the student at various times during training to entertain and hold the attention of the student. With the above discussion of the screen shots in mind for Canine Crew, attention is now directed at FIG. 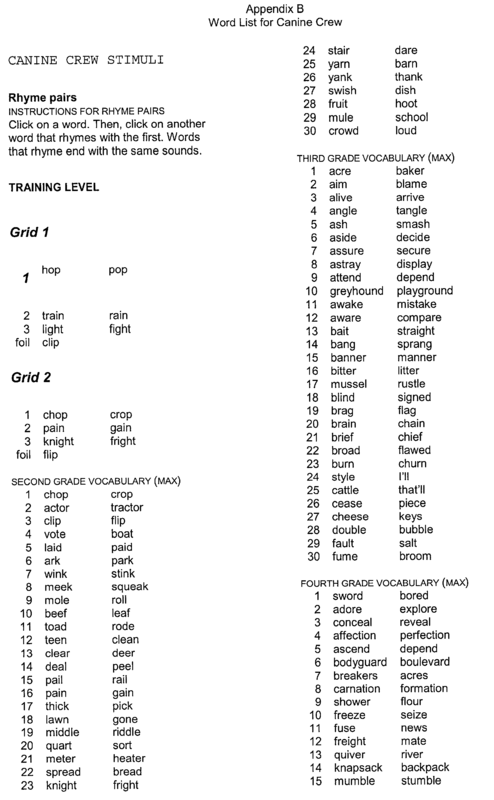 23 where a flow chart  2300 is provided particularly illustrating how a student is trained in the game Canine Crew, as well as how the student advances through the four semantic and phonological categories. To better understand the terminology related to flow chart 2300, Table II is provided below to provide definitional assistance. so does the grade level of the vocabulary. certain category at a certain level. each in a unit of 9 matches. Flow begins at block  2302 and proceeds to block 2304. At block  2304 an initial training sequence is begun. The student begins training in Rhymes at Level 0. S/he will train by pairing 6 matches from three different word families. These matches are presented in two screens of 3 matches each (each screen has seven words). Level 0 is considered “training”. This level differs from the others in that it has only one unit, and that unit has only two screens. Also, if the training is failed 3 times then the user progresses to the next unit and the training unit is not placed at the end of the list for further play. So, after Level 0 is set, flow proceeds to block 2306. At block  2306, three word pairs (with seven words) are presented by displaying them as a brickload to the student (as shown in FIG. 17). As mentioned above, the student selects a first word, which is highlighted, and then selects a second word that rhymes with the first word. If the student correctly matches a pair of words, a “ding” is played, and the words are removed from the screen and dropped into the pothole. 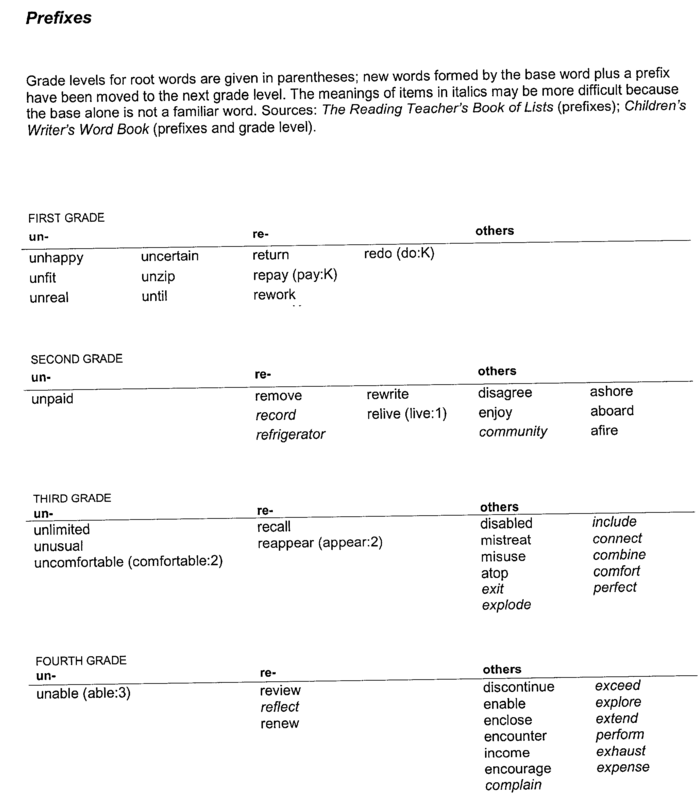 If the student incorrectly matches a pair of words, the words are un-highlighted, and the student continues selecting. When three pairs of words have been matched, and the brickload has been moved to the pothole, flow proceeds to decision block 2308. At decision block  2308 a determination is made as to whether the student has completed two screens of trials. If not, flow proceeds to block 2310. Otherwise, flow proceeds to decision block 2312. At block  2310, a new word set is selected from Level 0, and flow proceeds to block 2306 where the new words are presented to the student. At decision block  2314, a determination is made as to whether the student has trained at level 0 three times. If not, the student remains at level 0, and repeats the two screen trial again with flow proceeding back to block 2310. If the student has trained at level 0 three times, but has not accomplished a 90% success rate, flow still proceeds to block 2316. 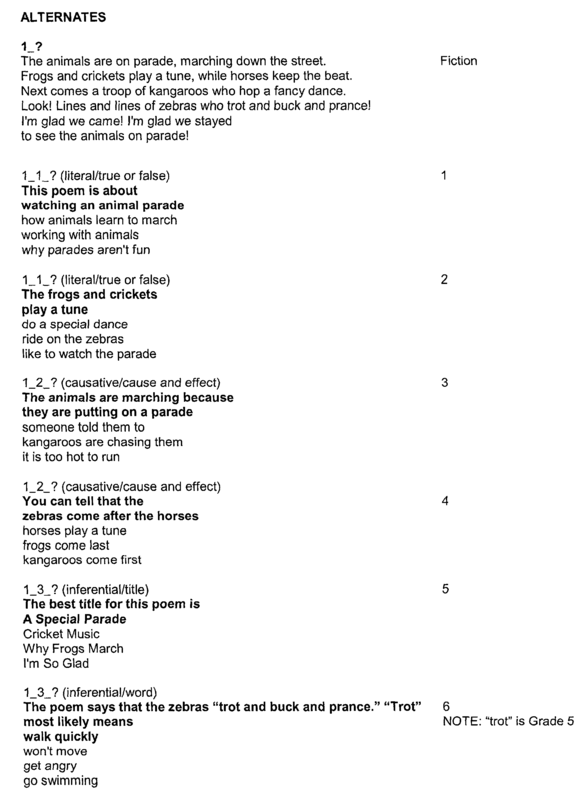 At block  2316, the student advances to level 1 for the category Rhymes. Flow then proceeds to block 2318. At block  2318, the Category is set to Rhyme, the Level is set to 1, and the Unit is set to 1 so that the first screen for Level 1 can be presented. Flow then proceeds to block 2320. At block  2320 a screen is presented as a trial. 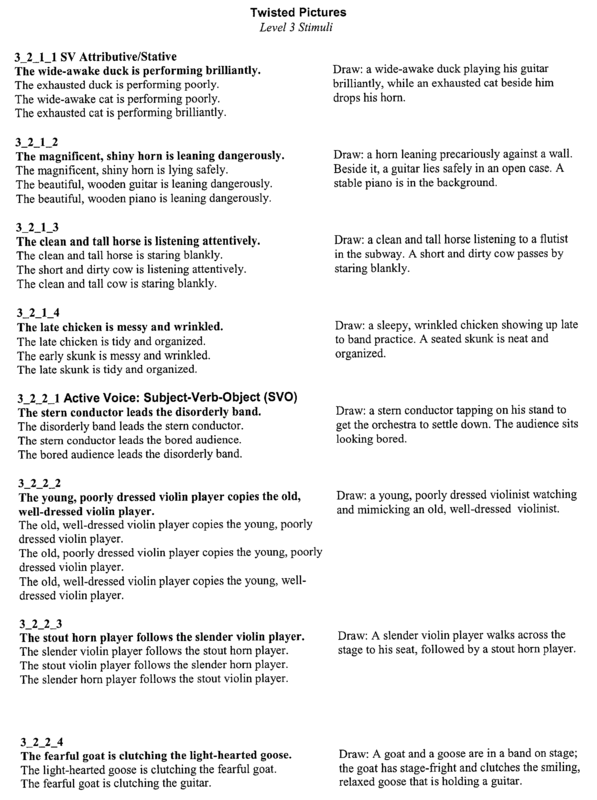 The number of words presented is initially seven, at level 1 within the category Rhyme. However, the number of words presented, the level presented, and the category presented will vary as the student advances. For each screen that is presented, when the student has removed all of the words from the screen by matching pairs, flow proceeds to decision block 2322. At decision block  2322, a determination is made as to whether the student has completed three screens at the current unit. For example, initially the unit is set to one, meaning that for each screen, seven words are presented. 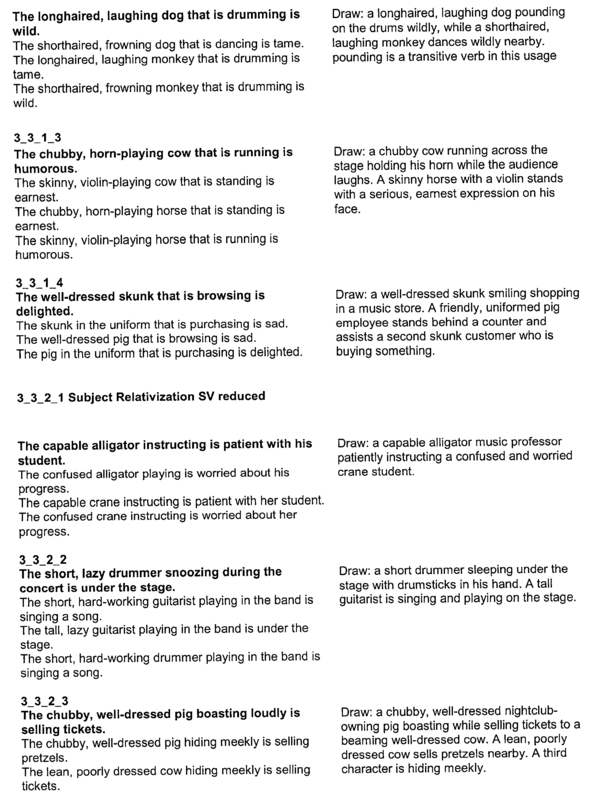 Alternatively, if the student is at level 2, thirteen words at presented for each screen. This is shown above in Table III. If the student has not completed three screens at the current unit number, flow proceeds to block 2324. Otherwise, flow proceeds to decision block 2326. At block  2324, the screen number is incremented, alternate word pairs from the current level are selected, and flow proceeds to block 2320 where a new screen is presented for training. At decision block  2326, a determination is made as to whether the student has obtained a 90% correct score for matching pairs of words on the three screens, at the present training level, for the present category. If not, flow proceeds to decision block 2328. Otherwise, flow proceeds to decision block 2330. At decision block  2328, a determination is made as to whether the student has trained at the present level, in the present category, three times. If not, then the screen number for the present level is reset to one, and the words for the present level are reordered and presented again at block 2320. However, if the student has trained three times at the present unit number, at the present level, in the present category (and has not achieved a 90% success rate), flow proceeds to block 2331. At block  2331, the unit # is advanced, and the failed unit is moved to the end of the land. That is, the present level is left “open” (meaning that ultimately the student will have to come back and complete the present unit number, at the present level before his/her training ends) and flow proceeds to block 2320. That is, a student is allowed three opportunities to achieve a 90% correct response before advancing to the next unit number, or if at unit 3, to the next level. If s/he is successful, then the unit/level is closed (i.e., not to be repeated again), and the student advances. If s/he is not successful, then the unit/level remains open, and the student advances. At decision block  2330, a determination is made as to whether the student is currently in unit 3 (21 words) at the present level, in the present category. If not, flow proceeds to block 2332. Otherwise, flow proceeds to decision block 2334. At block  2332, the unit number for the present level is incremented. For example, if the present unit number is 1 (7 words), then the unit number will be incremented to 2 (13 words). If the present unit number is 2 (13 words), the unit number will be incremented to 3 (21 words). Flow then proceeds back to block 2320 where the student will be presented with a screen at the new unit number, at the present level, in the present category. At decision block  2334, a determination is made as to whether the student is currently at level 3 for the present category. If not, flow proceeds to block 2336. Otherwise, flow proceeds to decision block 2338. At block  2336, the current training level is incremented, and the unit number is set to 1. For example, if the present training level is 2, and the present unit number is 3, the training level will be set to 3, and the unit number will be set to 1. Flow then proceeds to block 2320 where new words, at the new level are presented. At decision block  2338, a determination is made as to whether all categories have been completed. If not, flow proceeds to block 2340. Otherwise, flow proceeds to decision block 2342. At block  2340, the category number is incremented, and the level and unit numbers are reset to 1. For example, if the present category is 2 (Synonyms), then the category is incremented to 3 (Antonyms), and the level and unit numbers are reset to 1. Flow then proceeds back to block 2320 where training begins in the new category. At decision block  2342, a determination is made as to whether any units remain open, at any level, for any category. If not, then the student has achieved a 90% success for all units, at all levels, for all categories. Training is therefore completed, with flow proceeding to block 2344. Otherwise, one or more units, at one or more levels, for one or more categories remain open. Flow thus proceeds to block 2346. At block  2346, if the student arrives at this point, it is because s/he “plateaued” in a unit, being unable to achieve 90% correct after three tries at that level. As mentioned above with respect to decision block 2328, if the student is unable to obtain 90% correct after three trials in a unit, the student is advanced, but the unit remains open. In block 2346, all open units are repeated until the student obtains 90% correct. When s/he does, flow proceeds to block 2344 where training in Canine Crew ends. 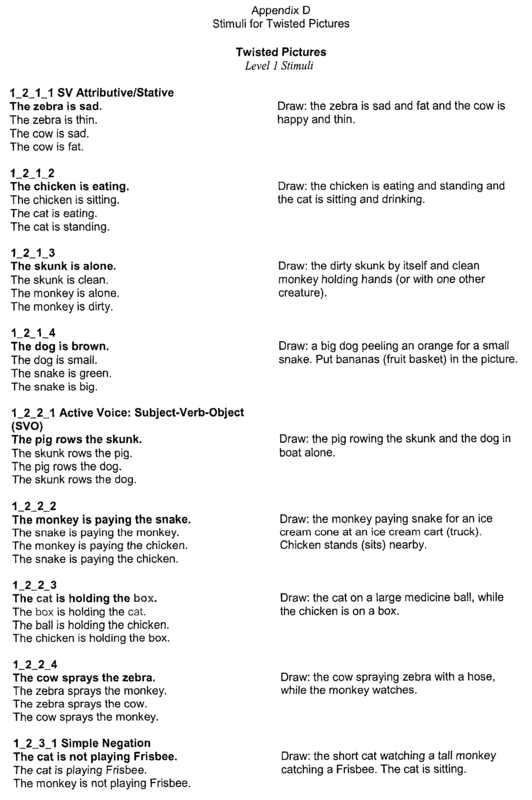 Chicken Dog trains a student in spelling by having the student associate the sound of a word with its spelling, and by having the student complete the written spelling of a spoken word. More specifically, Chicken Dog develops 1 st through 4th grade spelling skills by training the student to recognize: 1) every syllable has a vowel letter; 2) many sounds are represented with letter combinations; 3) how we spell a sound depends on its position in a word; 4) only certain letters are doubled; and 5) meaningful word parts are often spelled consistently. Referring now to FIG. 24, a screen shot  2400 is shown for the game Chicken Dog. The animated scene 2400 depicts a chicken character 2402 working a hot dog stand 2404. On the left of the stand 2404 is a cash register having a yellow paw 2406. As in the other games above, a trial begins when a student clicks on the yellow paw 2406. On the right side of the screen are 5 condiment containers 2408, each having a display square 2410 onto which will be presented one or more letters. When a trial begins, Chicken Dog 2402 presents a hot dog 2412 on the stand 2404, onto which will be placed a word that is missing letters. The size of the hot dog 2412 will vary depending on the size of the word presented. As in the previous two games, a score counter 2414 is provided to indicate to the student a score, reflecting their performance, and a timer 2416 indicating a relative time remaining for game play. Referring now to FIG. 25, a screen shot  2500 is presented subsequent to the student selecting the yellow paw 2506. Like elements have like references, the hundreds digits being replaced with a 25. After the paw 2506 is selected, Chicken Dog 2502 presents a hot dog 2512 with a word 2520 on it. When the word 2520 is presented, it is also played aurally by the computing device on which the program is run so that the student being trained hears the entire word, in addition to seeing it. The word is missing a letter or letters which must be filled in by the student. When the word  2520 is presented, five letters, or letter combinations, are inserted into the condiment containers 2508. In this scene, the word 2520 that is played is “following”, and the word presented is “follo_ing”. The student must select one of the five letters 2522 as a letter to complete the word 2520. For each trial, one correct answer and four incorrect (foil) answers are provided. The first trial that is played by the student highlights the correct letter, in this case “w”, to complete the word “follo_ing”. When the student selects the correct letter  2522, a “ding” is played indicating a correct selection, all the letters disappear from the condiment containers 2508, and the letter appears in the word 2520 as will be further illustrated below. If the student selects one of the foil letters, a “thunk” is played indicating an incorrect selection, and the correct letter is placed into the word 2520 to illustrate to the student the correct selection. 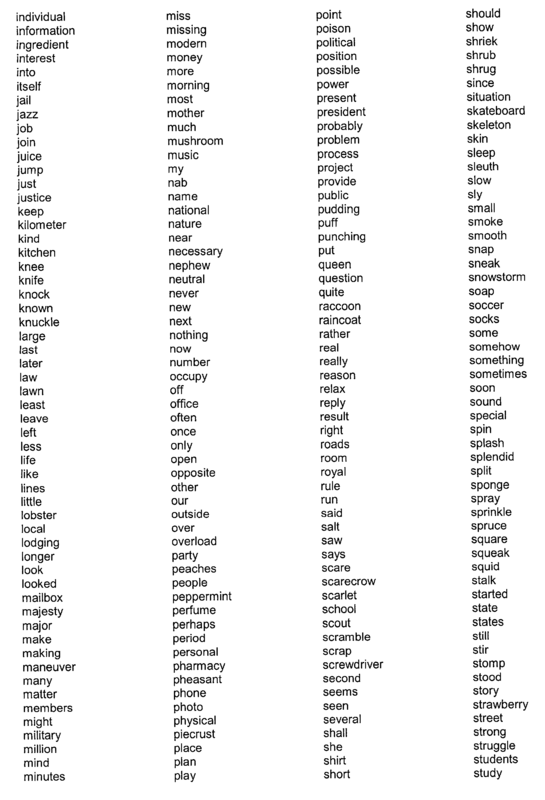 If at any time during a trial the student wishes to have the word played aurally, s/he can again select the yellow paw 2506, and the word will be played. Referring now to FIG. 26, a screen shot  2600 is shown illustrating a word 2620 “me_bers” that has been presented, visually and aurally to the student. The student indicates that the missing letter is “m” 2622 which is highlighted when the cursor is on top of the letter. After selecting “m” 2622 to complete the spelling of the word “members”, the “m” drops down into the word 2620, as is shown in FIG. 27. Additionally, the program adds an entertaining animation (not shown) upon each correct selection wherein the condiment container associated with the correct letter is manipulated by Chicken Dog 2702 to squirt, pour, shake, etc., some ingredient onto the hot dog 2712. Furthermore, similar to the other games described above, after a number of trials, a reward animation (not shown) is played for the student to further enhance their enjoyment of the game. Referring now to FIG. 28, a flow chart  2800 is shown that provides an overview of the training steps for each trial in Chicken Dog. Flow begins at block 2802 and proceeds to decision block 2804. At decision block  2804, a determination is made as to whether the yellow paw 2406 has been selected. If so, flow proceeds to block 2806. Otherwise, play remains at decision block 2804 until the student selects the paw 2406. At block  2806, the correct trial to be presented is determined as is further illustrated below with respect to FIG. 31. Flow then proceeds to block 2808. At block  2808, the particular trial selected in block 2806 is presented to the student. 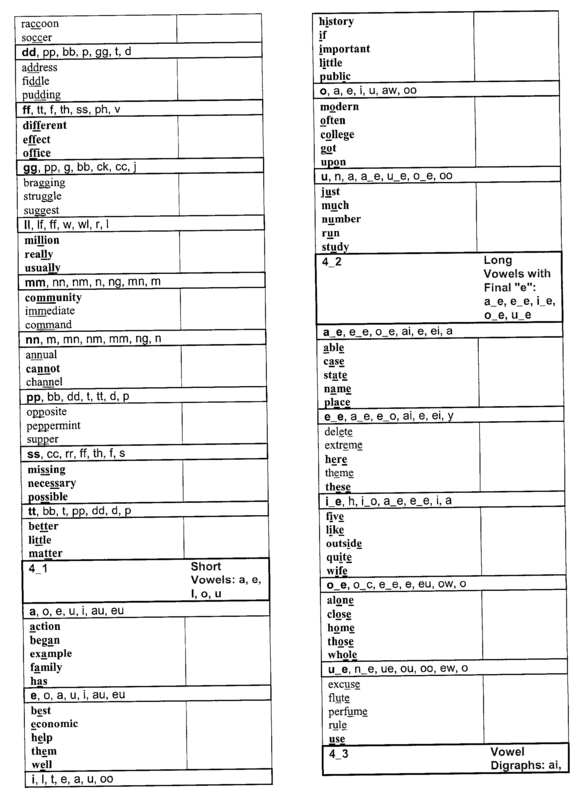 As described above, the word being tested is aurally presented to the student, a portion of the word is visually presented to the student, and the correct answer, along with a number of foils are presented to the student. Flow then proceeds to decision block 2810. At decision block  2810, a determination is made as to whether the student has selected an answer. If not, flow remains at decision block 2810 until the student selects an answer. Otherwise, flow proceeds to decision block 2812. At decision block 2812, a determination is made as to whether the student correctly responded in the trial. If so, flow proceeds to block 2816. Otherwise, flow proceeds to block 2814. At block  2814, the incorrect response is indicated by playing a “thunk”, and then the correct completed word is presented. Flow then proceeds back to decision block 2804 awaiting instigation of another trial. At block  2816, the correct response is indicated by playing a “ding”, and then the correct completed word is presented. Flow then proceeds back to decision block 2804 awaiting instigation of another trial. ending and medial) and one vowel category. Level : The level refers to the level of difficulty. given category at a given level. Referring to FIG. 29, a screen shot  2900 is shown of play at level 2 for the beginning blend “tr”. 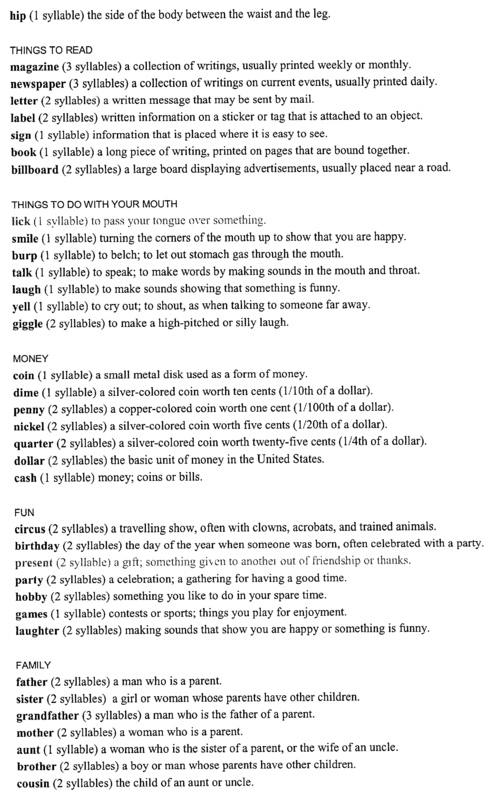 The word “icyle” 2920 is presented, and the word “tricyle” is played. The student must select the blend “tr” 2922 to correctly answer the trial. Referring to FIG. 30, a screen shot  3000 is shown illustrating the completed word tricyle 3020, and animating Chicken Dog 3002 providing condiments on the hot dog from the container 3008 that contained the blend “tr”. Referring now to FIG. 31, a flow chart  3100 is provided illustrating how a student advances through all the levels of all the categories in Chicken Dog. Flow begins at block 3102 and proceeds to block 3104 where determination of advancement for the next trial is begun. Flow then proceeds to decision block 3106. At decision block  3106, a determination is made as to whether there are any trials remaining within the existing level (for the presently selected category). If not, then flow proceeds to decision block 3108. Otherwise, flow proceeds to block 3124. At block  3124 the next category is randomly selected. For example, given four categories (A, B, C, and D), trials are presented randomly across all four categories, for each four instances. That is, if the first trial is presented in category A, the next trial will come randomly from categories B, C, D. If the next trial comes from category C, the trial after that will come randomly from categories B or D. After a trial is presented from each category, the process is repeated for the four categories. Thus, categories are randomly selected, while insuring that at least one trial from each category is presented every four trials. This continues until a category is closed (see block 3120). Flow then proceeds to block 3126. At block  3126, a trial is randomly selected from the present level, for the presently selected category. At this point, the trial is selected, and game play continues as defined in FIG. 28. At decision block  3106, if there are no more trials remaining within the present category, within the present level, flow proceeds to decision block 3108. At decision block  3108 a determination is made as to whether the student has obtained a 90% correct status for that level. If s/he has, then flow proceeds to decision block 3116. Otherwise, flow proceeds to decision block 3110. At decision block  3110, a determination is made as to whether the student has failed the present level, for the present category 3 times? If not, then flow proceeds to block 3114. Otherwise, flow proceeds to block 3112. At block  3114, the level for the present category is left open, meaning that all trials for the present level, for the present category will be repeated. Flow then proceeds to block 3124 where the next category for trial is selected. At block  3112, the present level, for the present category is placed at the end of the line for the category, and the next level is selected for the present category. That is, if the present category has 4 levels, level 1 has already been passed, and the present level is level 2, then the level selected for the present category is level 3, and level 2 is placed behind level 4, to be repeated later. Flow then proceeds to block 3124. At decision block  3116, a determination is made as to whether any levels are left in the present category. If there are, flow proceeds to block 3118. Otherwise, flow proceeds to block 3120. At block  3118, the present level for the present category is closed, and the level for the present category is incremented. Flow then proceeds to block 3124. At block  3120, the present category is closed. That is, the student has reached block 3120 because s/he has obtained a 90% correct status across all trials, across all levels, for the present category. Thus, the present category is removed from the list of randomly selected categories (block 3124). Flow then proceeds to decision block 3122. At decision block  3122, a determination is made as to whether any categories remain open. If there are, flow proceeds to block 3124 where the next open category is selected. Otherwise, flow proceeds to block 3128. At block  3128, the game is complete. The student has arrived at this block by obtaining a 90% correct status across all trials, for each level, for each category. Referring now to FIG. 32, a screen shot  3200 is provided illustrating the opening scene for the game Twisted Pictures. The game screen 3200 is somewhat similar to the other games described above, having a yellow paw 3202 that must be selected by a student to start a trial, a counter 3204 for keeping track of the student's score, and a timer 3206 for indicating a relative time remaining for game play. In addition, there is a frame 3208 for holding a painting associated with each trial, and a parchment 3210 for holding four sentences, one that correctly describes the picture in the frame 3208, and three foils. The student must select the sentence that correctly describes the picture. Referring now to FIG. 33, a screen shot  3300 is provided illustrating the first trial presented to the student. The screen 3300 contains a picture 3312 of a rat, and a cat in a café. The four sentences provided on the parchment 3310 for selection are: 1) The rat is dancing; 2) The bird is dancing; 3) The rat is sitting; and 4) The cat is sitting. 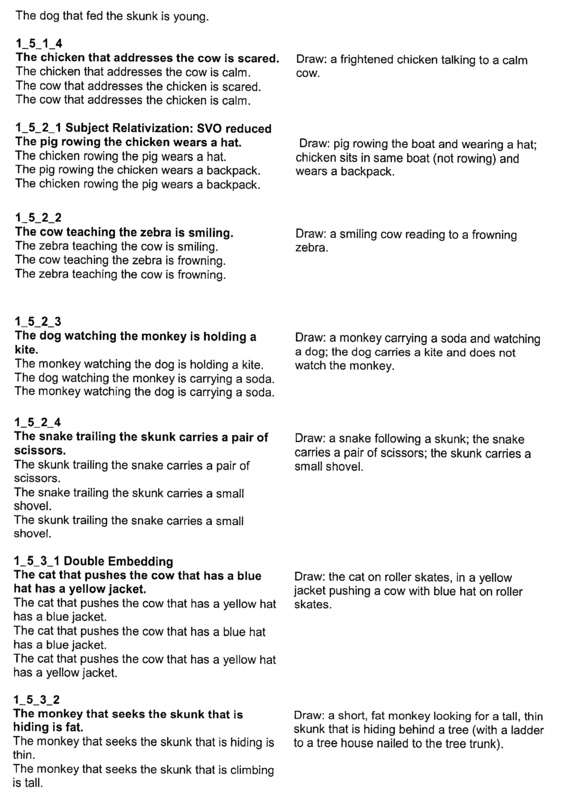 The sentence that correctly describes the picture is “The rat is sitting.” The first time the student plays Twisted Pictures, the correct sentence flashes to indicate the correct selection. 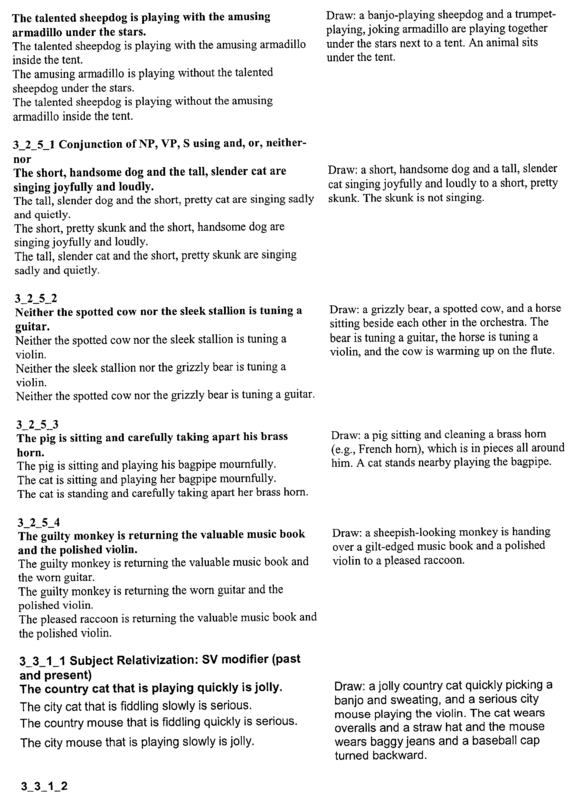 When the student selects “The rat is sitting”, a “ding” is played, indicating correct selection, and the screen removes the picture 3312 and sentences on the parchment 3310, leaving the screen like that shown in FIG. 32. Referring now to FIG. 34, a screen shot  3400 is shown illustrating an incorrect selection. The screen shows a picture 3412 of a cat holding a green ball, and a dog holding a white ball. 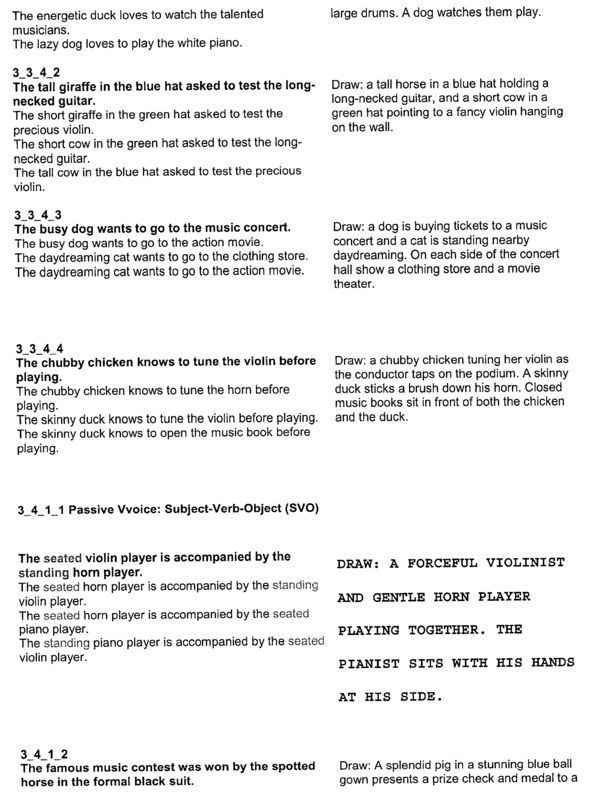 The four sentences provided on the parchment 3410 are: 1) The dog that played with the cat that has a green ball has a white ball (correct); 2) The dog that played with the cat that has a white ball has a white ball (incorrect); 3) The dog that played with the cat that has a green ball has a green ball (incorrect); and 4) The dog that played with the cat that has a white ball has a green ball (incorrect). 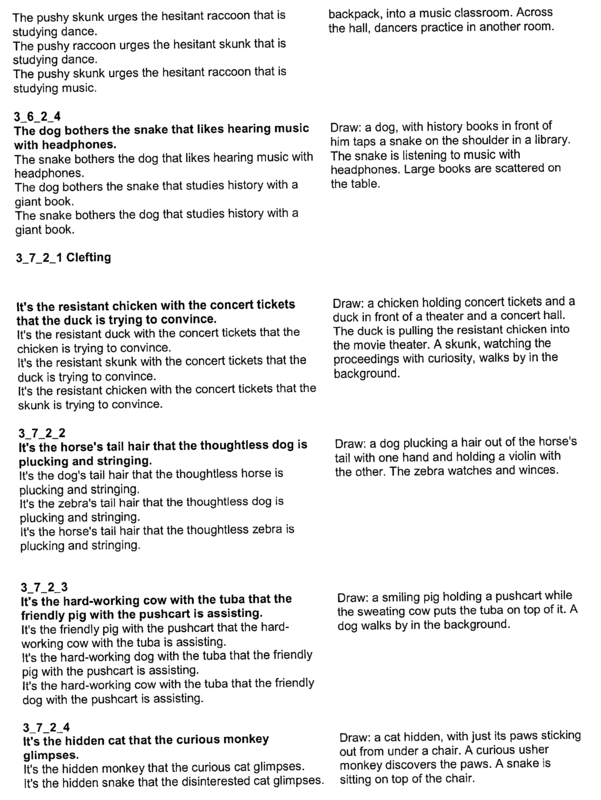 When the student selects sentence 2, a “thunk” is played, indicating that the student incorrectly selected a sentence. 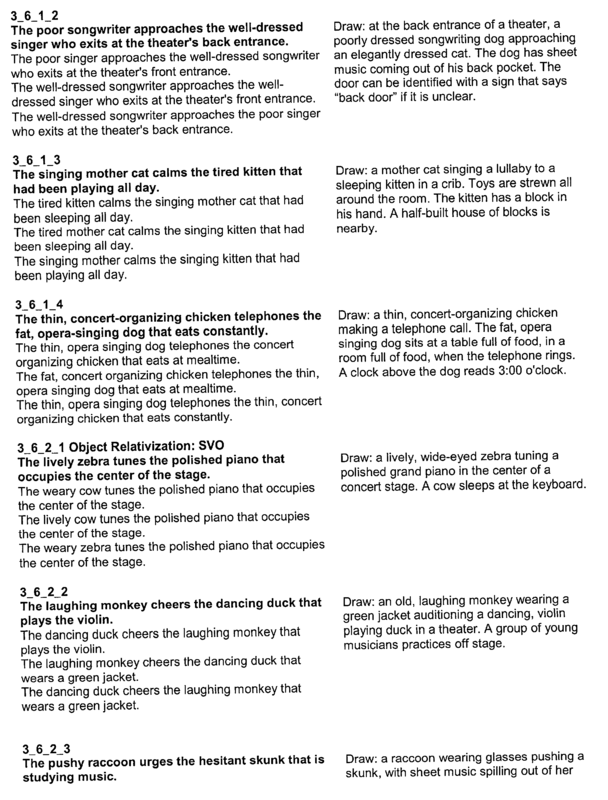 In addition, the incorrect sentences are removed, and the correct sentence (in this case sentence 1) is highlighted to indicate to the student the correct sentence. The screen is then cleared back to the state shown in FIG. 32. Referring now to FIG. 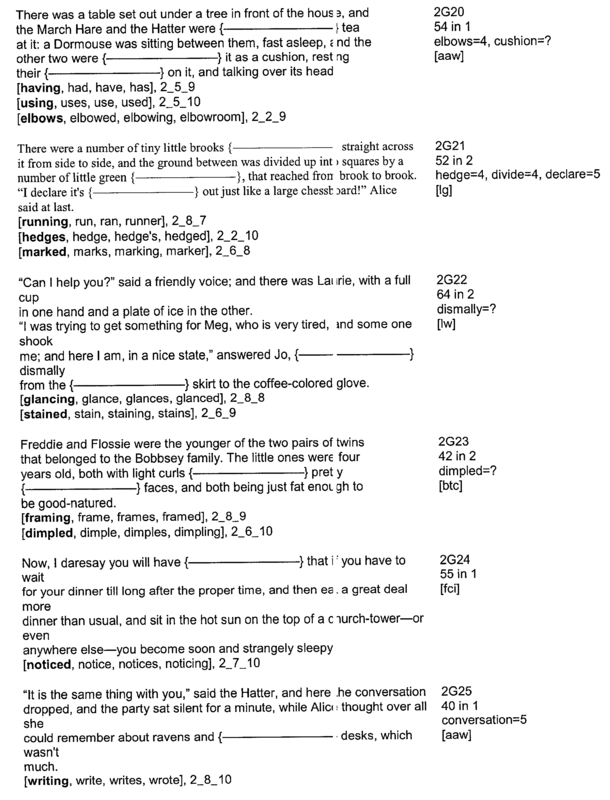 35, a screen shot  3500 is shown of a more complex sentence structure (provided at a more advanced training level in the program). The scene 3500 has a picture 3512 of a sheepdog and an armadillo playing music outside a tent. 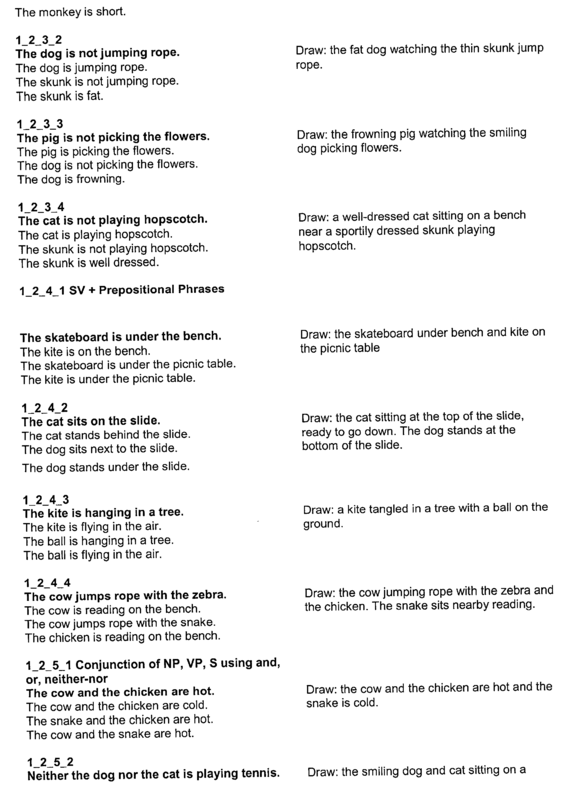 The four sentences provided on the parchment 3510 are: 1) The talented sheepdog is playing with the amusing armadillo inside the tent; 2) The talented sheepdog is playing without the amusing armadillo inside the tent; 3) The amazing armadillo is playing without the talented sheepdog under the stars; and 4) The talented sheepdog is playing with the amusing armadillo under the stars. The correct sentence, of course, is sentence 4. 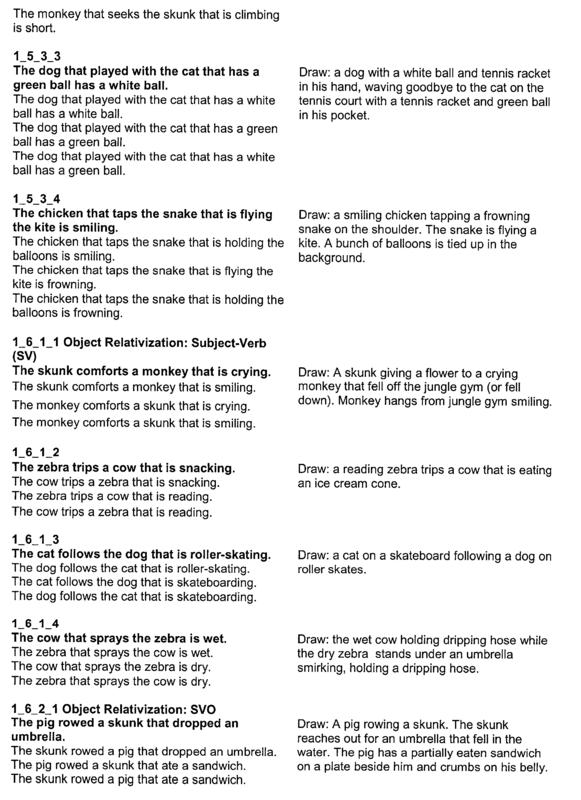 Level 1: The student trains on sentences that contain, on average, 6 words. Words are at the 2 nd grade level at highest. 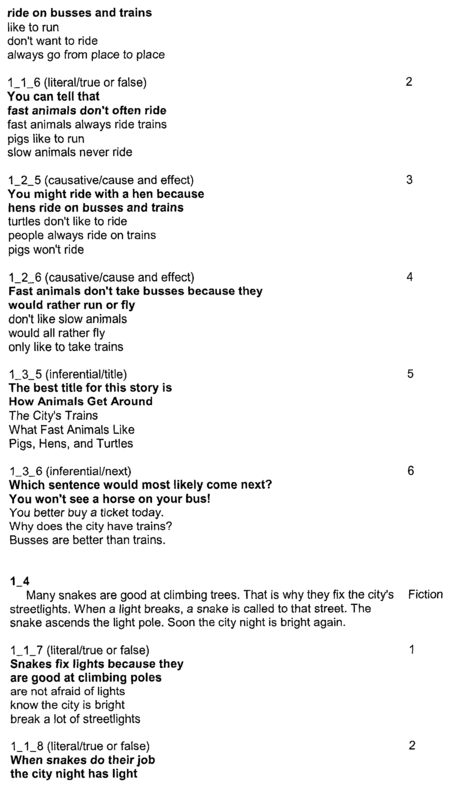 Level 2: The student trains on sentences that contain, on average, 8 words. Words are at the 3 rd grade level at highest. 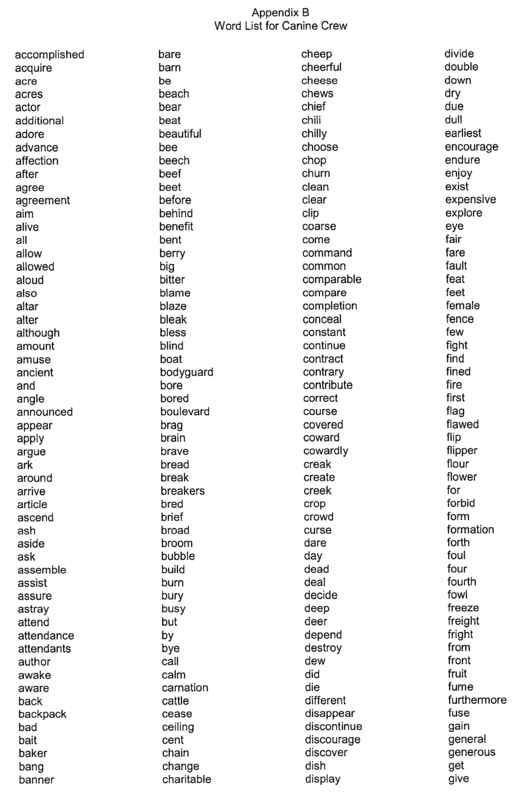 Level 3: The student trains on sentences that contain, on average, 12 words. Words are at the 4 th grade level at highest. 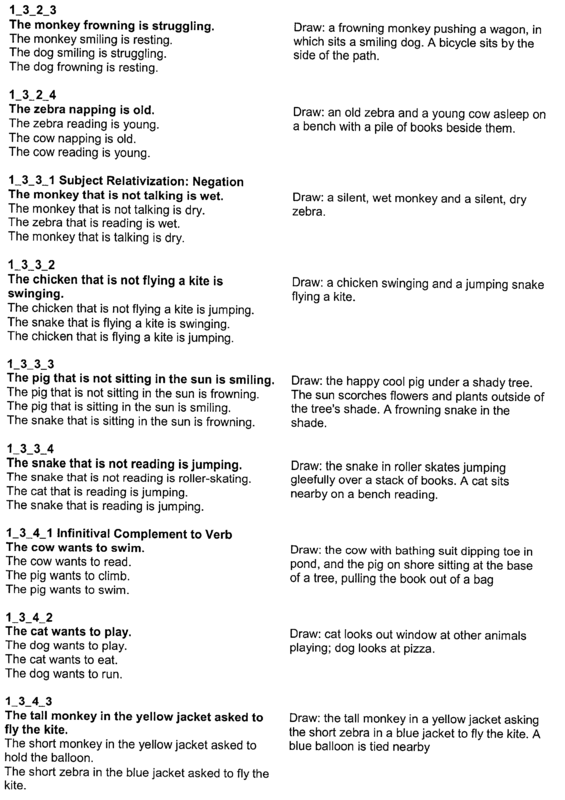 Initially, the student is presented with a trial from a first category, like Simple Negation, which is a 1 st tier of syntactical complexity. After the student chooses the most accurate sentence for the trial, Twisted Pictures presents three more trials from the Simple Negation category. 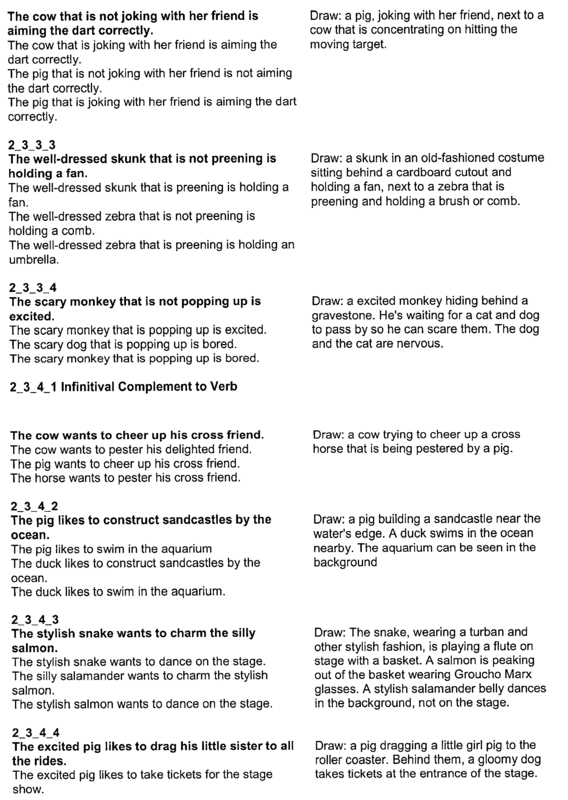 When the student has completed all four Simple Negation trials, Twisted Pictures might present a trial from the Embedded Passives category, which is in the 6th tier of syntactical complexity. After the student has completed all the trials in one level, Twisted Pictures evaluates all the trials for that level. 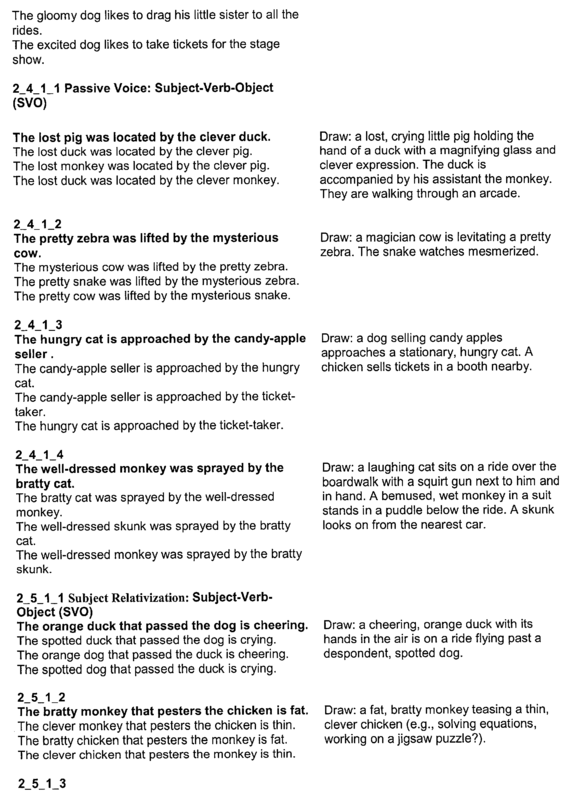 If the student has chosen 90 percent of the sentences correctly, Twisted Pictures advances to the next level. Referring now to FIGS. 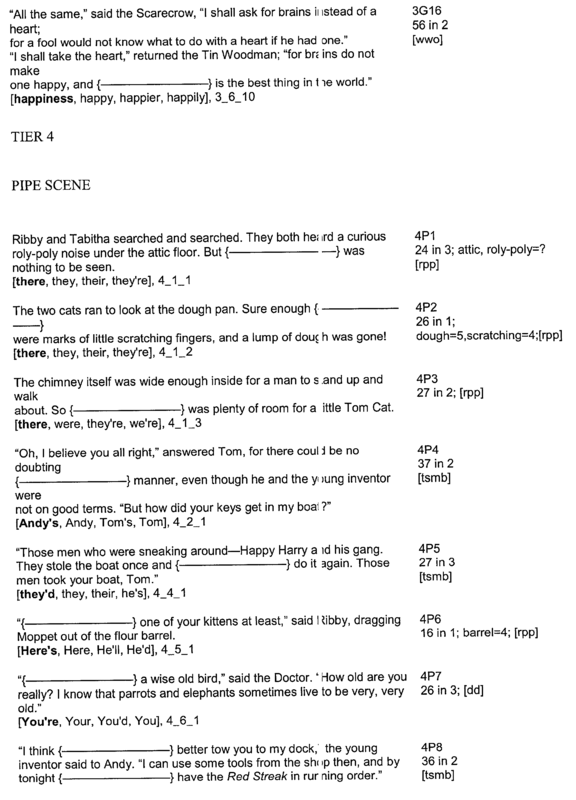 36 and 37, flow charts  3600 and 3700 are provided to particularly illustrate game play in Twisted Pictures, as well as the methodology for advancing a student in game play. Game play begins at block 3602 and proceeds to decision block 3604. At block  3604, a decision is made as to whether the student has selected the yellow paw 3202. If not, flow continues at decision block 3604 until the paw 3202 is selected. When selected, flow proceeds to block 3606. At block  3606, a trial is selected according to the methodology described below with reference to FIG. 37. Flow then proceeds to block 3608. At block  3608, the selected trial is presented. Flow then proceeds to decision block 3610. At decision block block  3610, a determination is made as to whether the student correctly or incorrectly responded to the trial. If correct, flow proceeds to block 3614. Otherwise flow proceeds to block 3612. At block  3612, a “thunk” is played to indicate to the student that his/her response was incorrect. 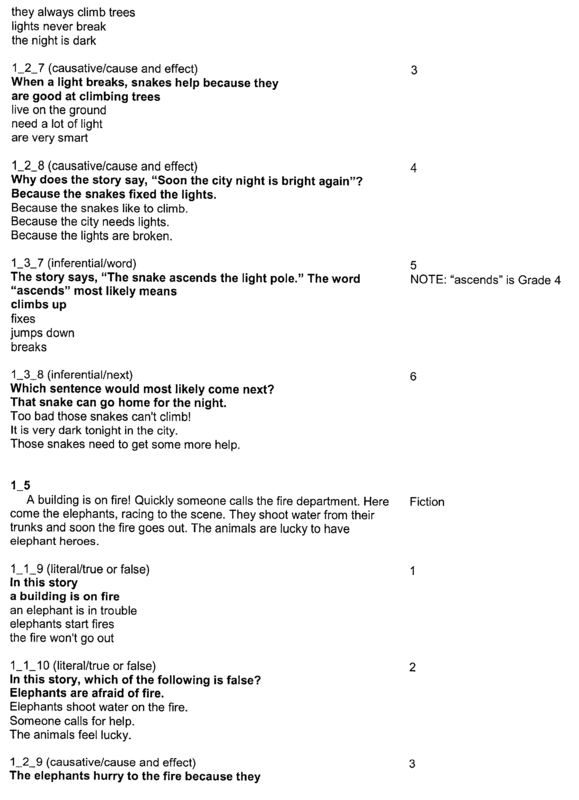 In addition, the correct answer is highlighted, and the trial is recorded. That is, the syntactical category, level, and sentence group, along with the outcome (correct or incorrect) are recorded. Flow then proceeds back to decision block 3604 to await initiation of another trial. At block  3614, a “ding” is played to indicate to the student that his/her response was correct. In addition, the correct answer is highlighted, and the trial is recorded. 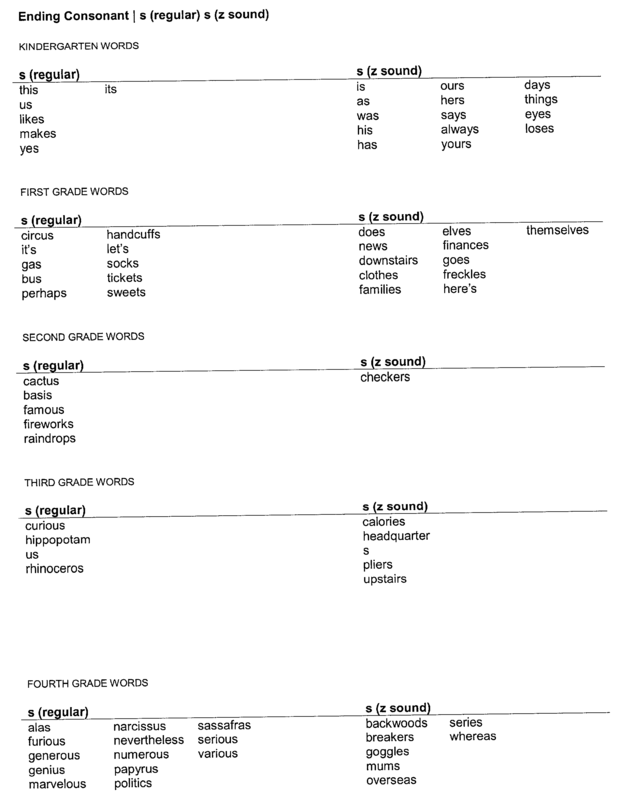 That is, the syntactical category, level, and sentence group, along with the outcome (correct or incorrect) are recorded. Flow then proceeds back to decision block 3604 to await initiation of another trial. Referring now to FIG. 37, a flow chart  3700 is provided illustrating the advancement methodology for the game Twisted Pictures. Flow begins at block 3702 and proceeds to block 3704. At block  3704, the training level is set to Level 1. Flow then proceeds to block 3706. At block  3706, the program randomly chooses a syntactical category for training from all of the remaining categories at the present level. 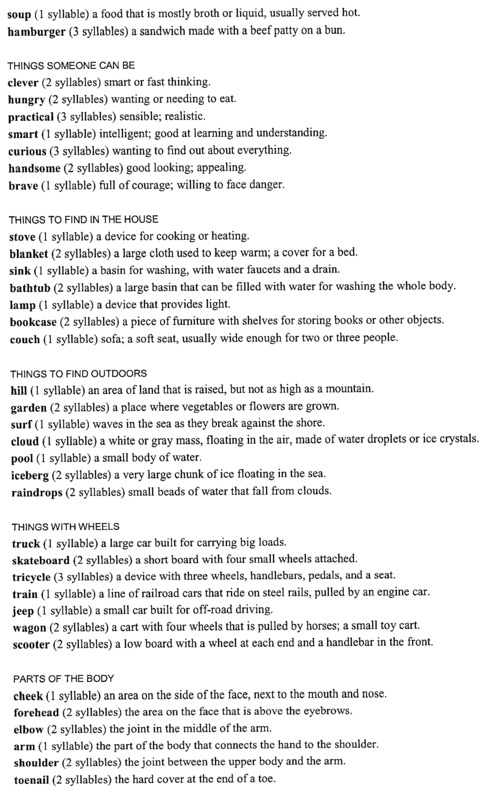 Initially, all the syntactical categories at level 1 are available. 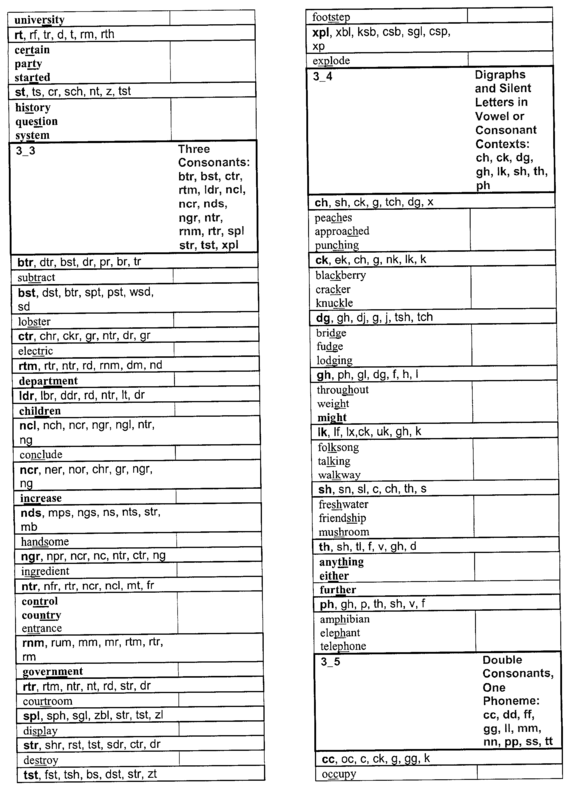 However, as the student correctly responds to trials within a syntactical category, those categories will be marked completed (in block 3716). So, block 3706 is responsible for choosing a syntactical category, at the present level, from those categories that are not yet marked completed. Flow then proceeds to block 3708. At block  3708, the program randomly chooses a trial from within the chosen syntactical category from the list of remaining trials within the chosen syntactical category. 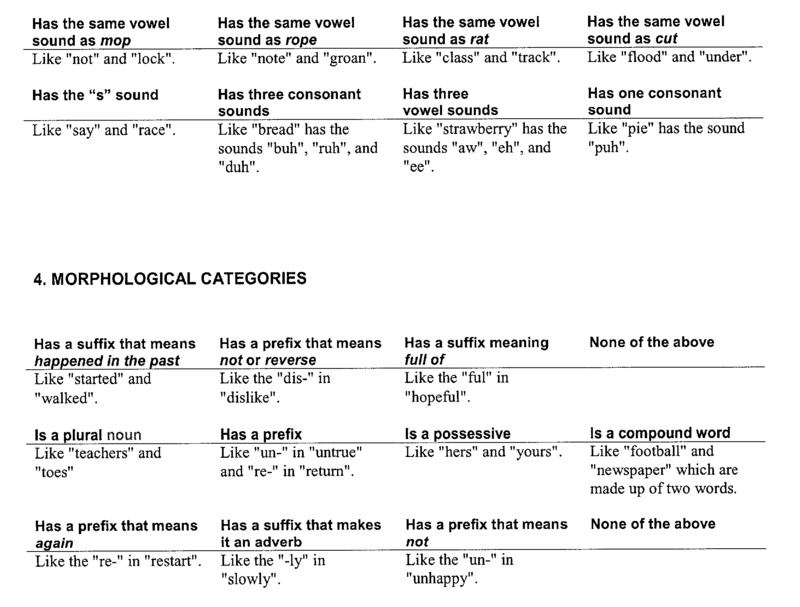 Initially, all of the trials within the chosen syntactical category are available. However, after a trial is presented, it is marked complete (at bock 3712). Thus, block 3708 is responsible for choosing a trial, within the chosen syntactical category, from those trials not yet marked completed. Flow then proceeds to decision block 3710. At decision block  3710, a determination is made as to whether all the trials within the chosen syntactical category have been presented. 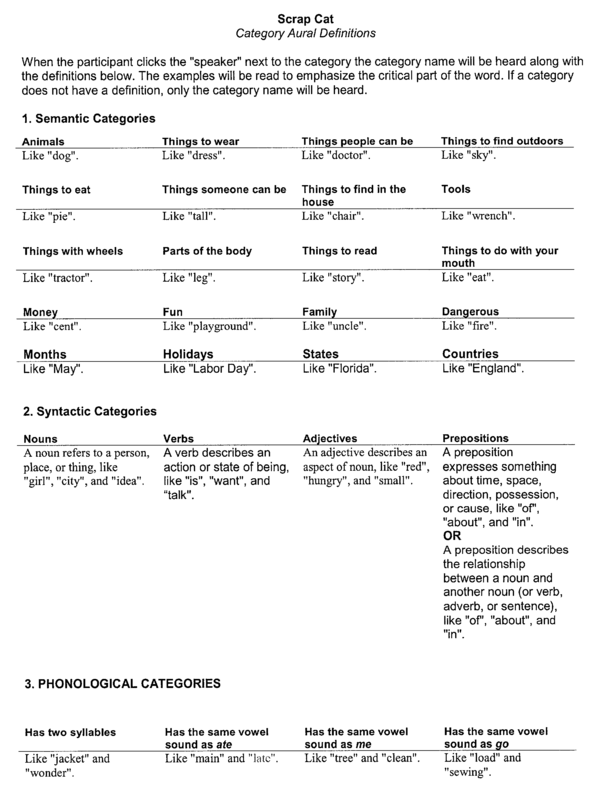 In one embodiment, there are four trials within each syntactical category, at each level. If all the trials have not been presented, flow proceeds to block 3712. Otherwise flow proceeds to decision block 3714. At block  3712, the present trial is marked complete. Flow then proceeds to block 3708 where another trial from the present syntactical category is chosen. At decision block  3714, a determination is made as to whether all syntactical categories, at the present level, have been completed. If not, flow proceeds to block 3716. Otherwise, flow proceeds to decision block 3718. At block  3716, the present syntactical category is marked complete. Flow then proceeds back to block 3706 where the program randomly chooses another syntactical category from the remaining categories. At decision block  3718, a determination is made as to whether the student has responded correctly to at least 90% of the trials across all syntactical categories at the present level. If not, flow proceeds to block 3720. Otherwise, flow proceeds to decision block 3722. At block  3720, all syntactical categories, and all trials within those syntactical categories, are reset, so that they may again be selected by block 3706/3708. That is, since the student has not correctly responded to 90% of the trials, s/he is required to repeat those trials, at the present level, albeit in random order. Flow then proceeds back to block 3706. At decision block  3722, a determination is made as to whether all levels have been completed. If not, flow proceeds to block 3724. Otherwise, the student has correctly responded to at least 90% of the trials, for all syntactical categories, for all levels, so the training ends, at block 3726. False statement about the paragraph? best title for this paragraph? likely to be the next line? Referring now to FIG. 38, a screen shot  3800 is shown of the opening scene in the game Book Monkeys. The setting is a library. As in the other games, a yellow paw 3802 is provided to allow a student to initiate a trial. A counter 3804 is provided to indicate the student's score, and a timer 3806 is provided to indicate a relative amount of time remaining for game play. Referring now to FIG. 39, a screen shot  3900 is shown that is presented after a student selects the yellow paw 3902. A book 3908 appears containing a story 3910. The student is aurally told to read the story, and when finished, to click the sign “done reading” 3912. The first time the student plays Book Monkey's, the “done reading” sign 3912 flashes to indicate to the student what they are to select. When the student is finished reading the story 3910, s/he presses the “done reading” sign 3912, and is taken to the screen presented in FIG. 40, to which attention is now directed. In FIG. 40, a screen shot  4000 is shown presenting a question 4014, and four answers 4016. There is one correct answer, and three foils for each question 4014. The student is to read the question 4014, and select the answer that most nearly matches the question. If the student selects the correct answer 4016, a “ding” is played, indicating a correct selection, and the correct selection is highlighted. 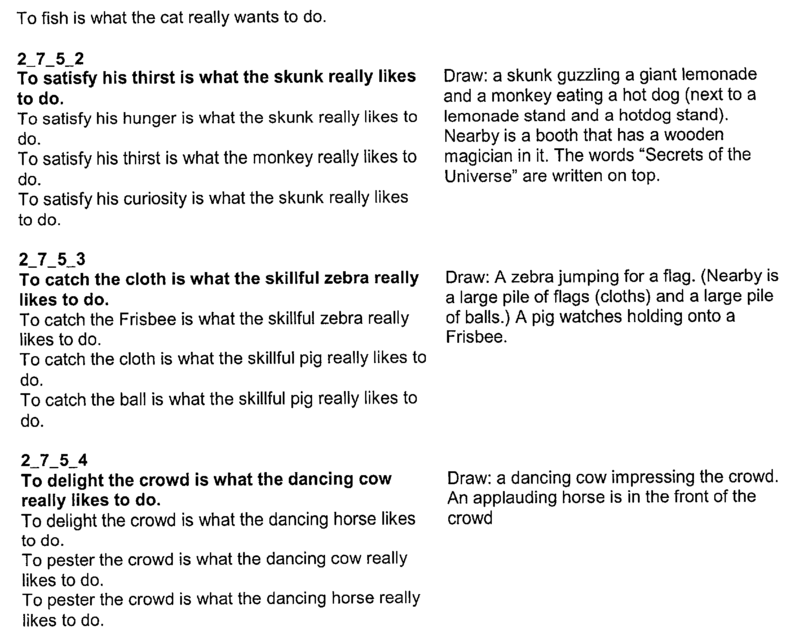 If the student selects an incorrect answer, a “thunk” is played, and the question and answers disappear. However, the next time the question is repeated, the incorrect answer that was selected is “grayed” out so that it is not available for selection. This is shown in FIG. 41, in the screen shot 4100, with the grayed out answer 4118. 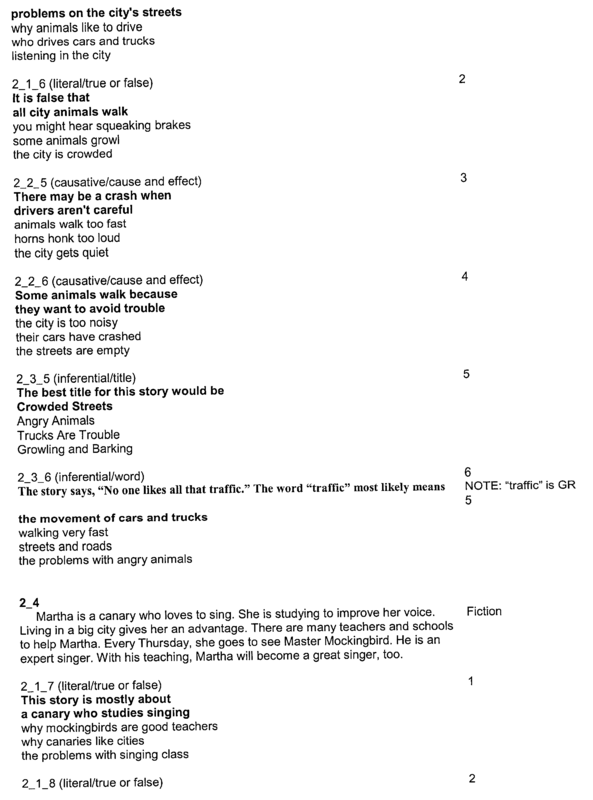 Level 1: The student trains on paragraphs of around 6 sentences; each sentence contains, on average, 10 words. Words are at the 2 nd grade level at highest. 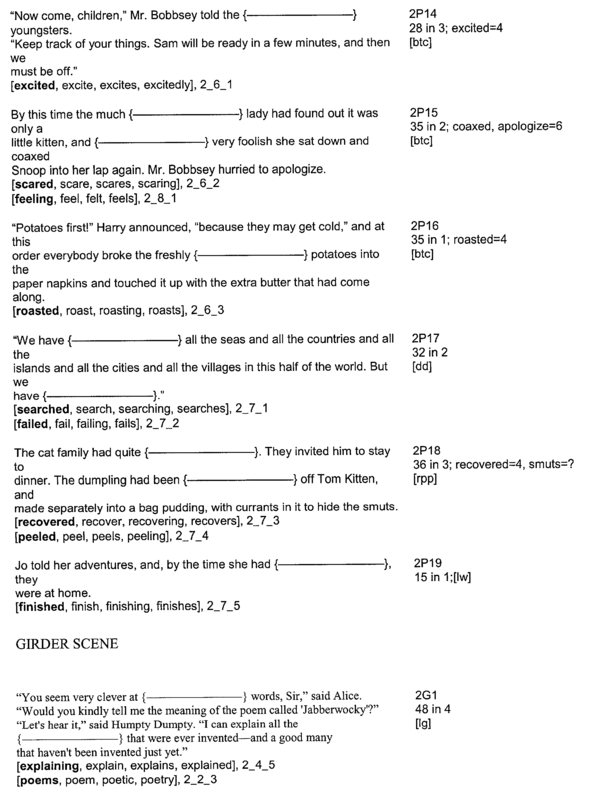 Level 2: The student trains on paragraphs of around 7 sentences; each sentence contains on average 12 words. Words are at the 3 rd grade level at highest. Referring now to FIGS. 42 a-c, a flow chart 4200 is provided illustrating the training and advancement methodology within the game Book Monkeys. Flow begins at block 4202 and proceeds to block 4204. At block  4204 the training level is set to Level 1. Flow then proceeds to decision block 4206. At decision block  4206, a determination is made as to whether the student has selected the yellow paw, and thereby initiating a trial. Flow remains at decision block 4206 until the student selects the paw. Once selected, flow proceeds to block 4208. 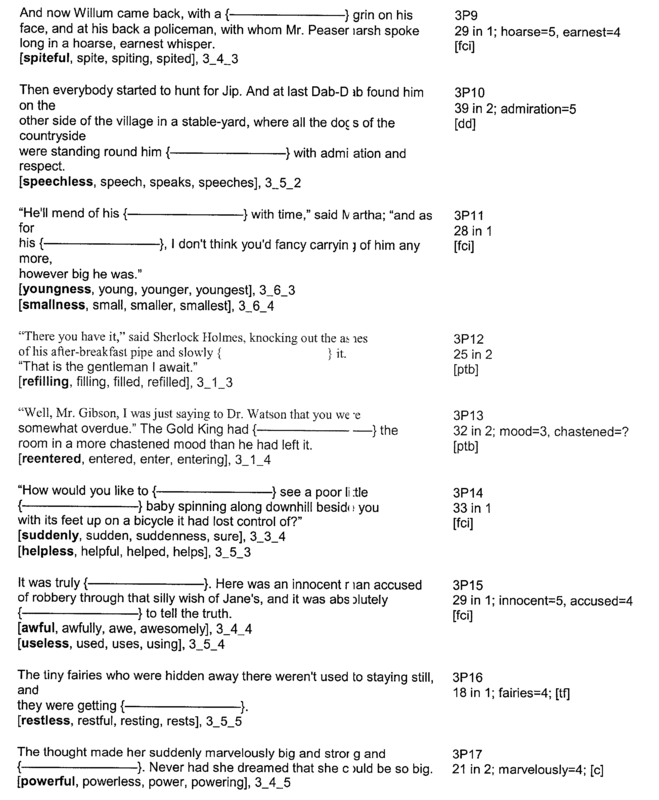 At block  4208, a paragraph is randomly selected from the set of paragraphs provided at the current training level. 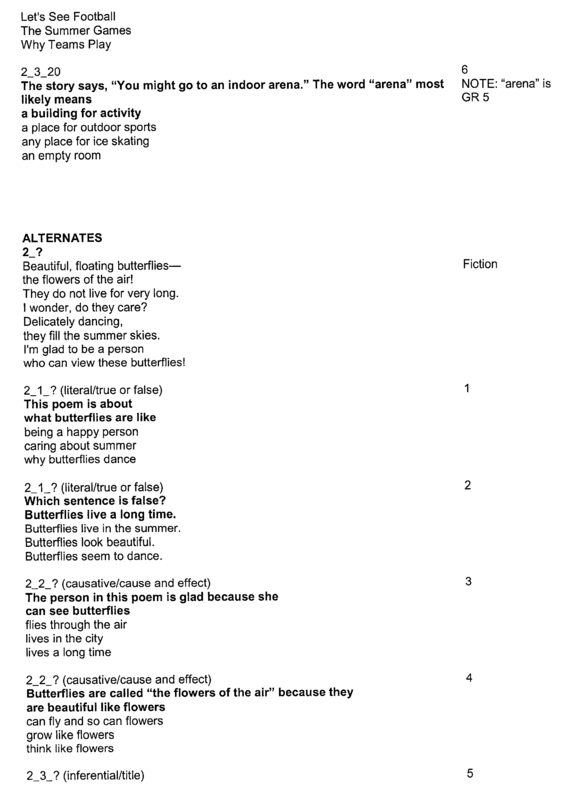 Initially, the Level is 1, and all paragraphs are available for selection. 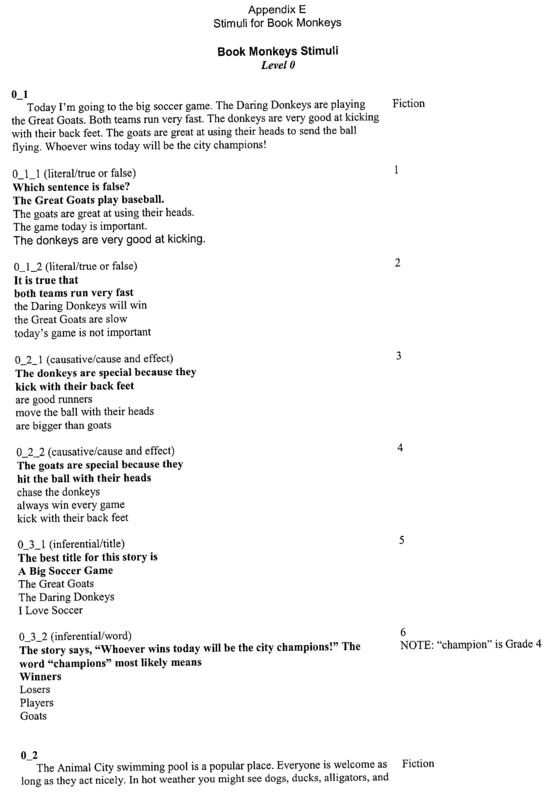 However, as the student progresses through the paragraphs, the remaining paragraphs are randomly selected, until all paragraphs have been played. Once a paragraph is selected, flow proceeds to block 4210. At block  4210, the paragraph is presented to the student as shown in FIG. 39. Flow then proceeds to decision block 4212. 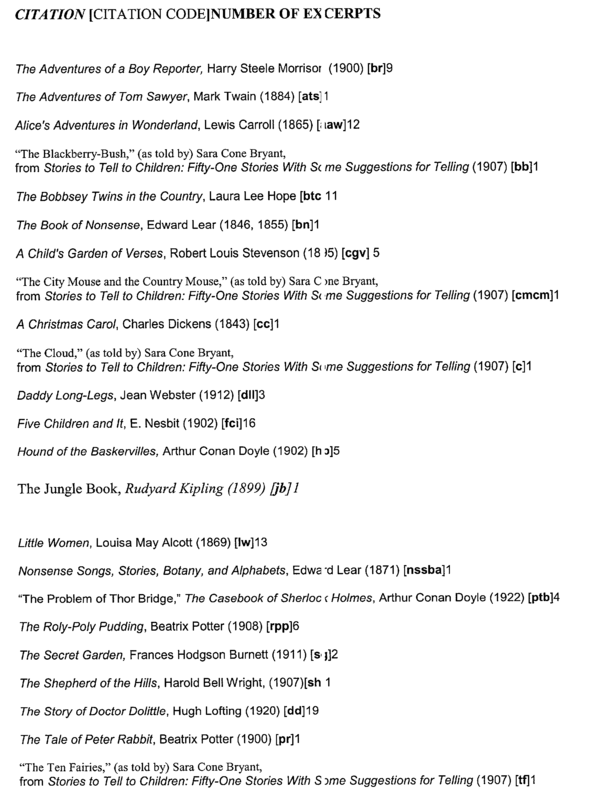 Flow remains at decision block  4212 until the student selects the “done reading” icon on the screen (as shown in FIG. 39). Once selected, flow proceeds to block 4214. 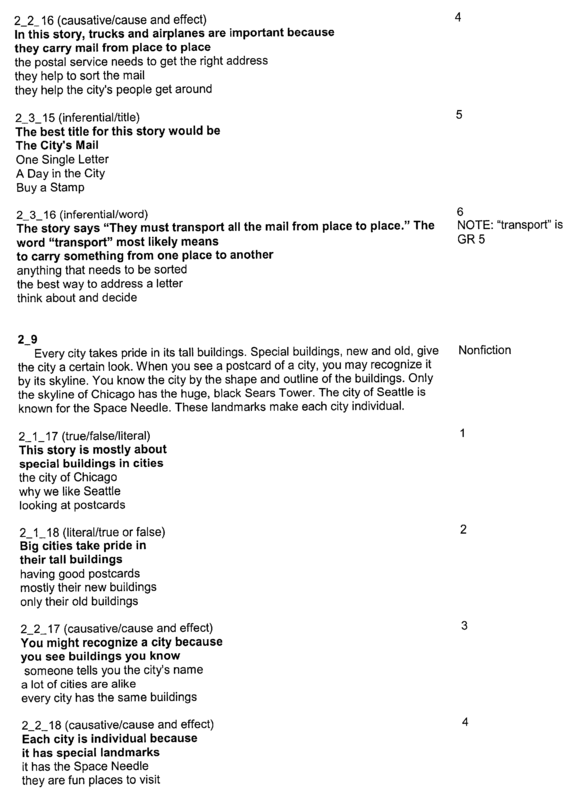 At block  4214, a question type is randomly selected for the present paragraph from the remaining question types. 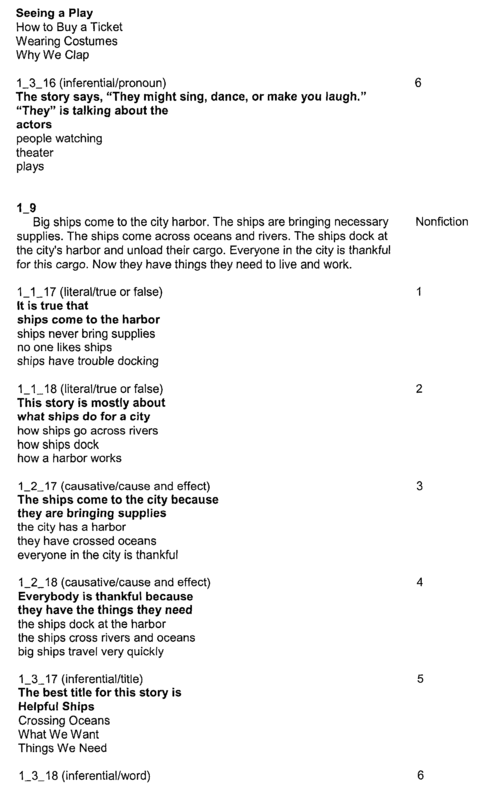 Initially, all question types are available for the present paragraph. 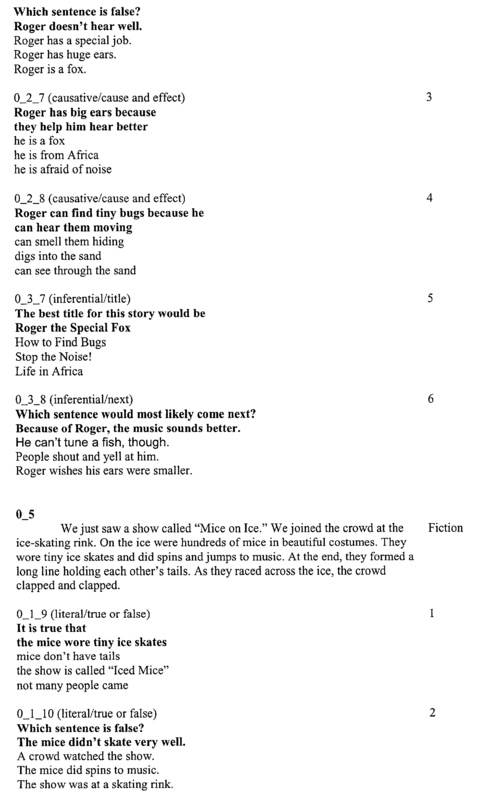 However, as the student advances through the question types, a selection is made from the remaining question types until all types have been presented. Flow then proceeds to block 4216. At block  4216, a question is randomly selected from the remaining questions for the present question type. Initially, all questions for the present question type are available. However, as the student advances through the questions, a selection is made from the remaining questions until all questions have been presented. Flow then proceeds to block 4218. At block  4218, the present question is presented to the student. Flow then proceeds to decision block 4220. At block  4220, a determination is made as to whether the student correctly answered the presented question. If not, flow proceeds to block 4222. Otherwise, flow proceeds to block 4224. At block  4222, a “thunk” is played indicating an incorrect answer. The answer is recorded as incorrect, and flow proceeds to decision block 4226. At block  4224, a “ding” is played to indicate a correct answer. The answer is recorded as correct, and flow proceeds to decision block 4226. At decision block  4226, a determination is made as to whether there are any more questions remaining for the present question type. If not, flow proceeds to block 4234. Otherwise, flow proceeds to decision block 4228. At decision block  4228, a determination is made as to whether two questions in a row have been presented to the student. 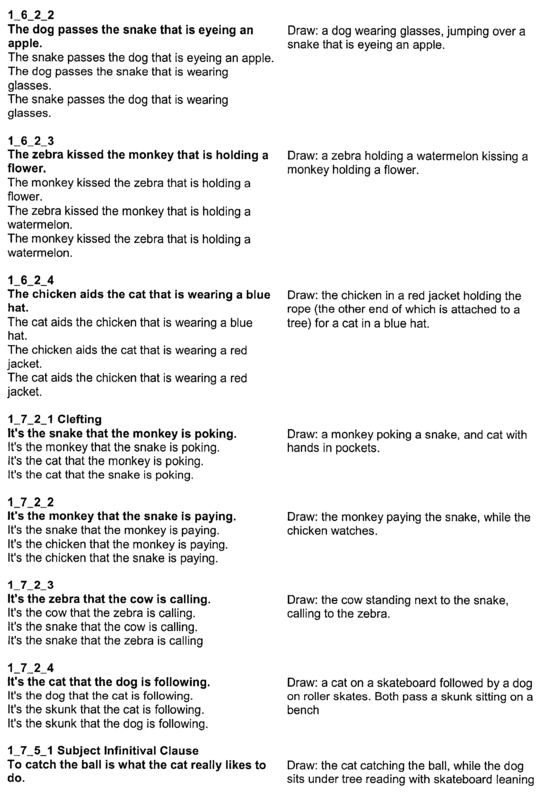 In one embodiment, Book Monkeys repeats the present paragraph after every two questions. 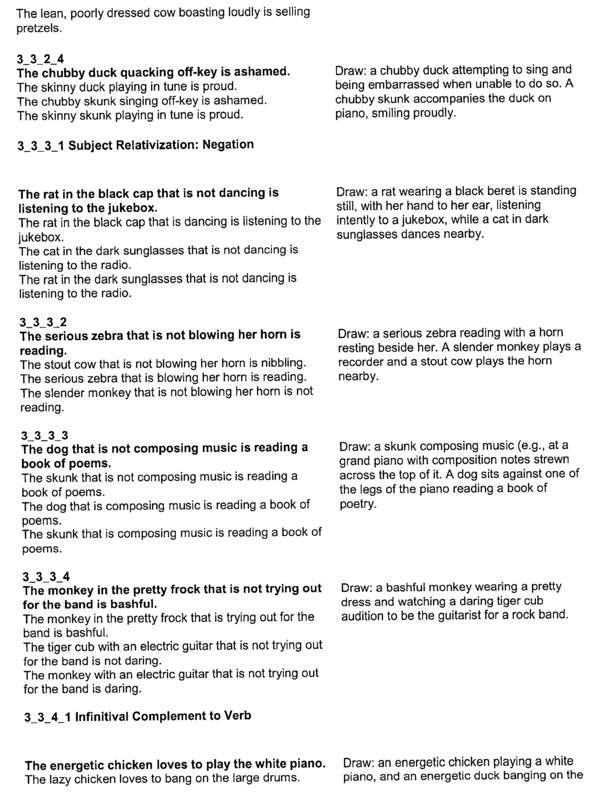 Book Monkeys recognizes that a student's memory may need to be refreshed for following questions, and therefore provides them with access to the paragraph every two questions. If there have not been two questions in a row, flow proceeds back to block 4216 where another question for the present question type is selected. Otherwise, flow proceeds to block 4330. At block  4330, the present paragraph is repeated. Flow then proceeds to decision block 4232. Flow remains at decision block  4232 until the student selects the “done reading” icon. Flow then proceeds back to block 4216 where another question for the present question type is selected. At block  4234, the present question type is marked complete. That is, there are no more questions remaining to be asked for the present question type. Flow then proceeds to decision block 4236. 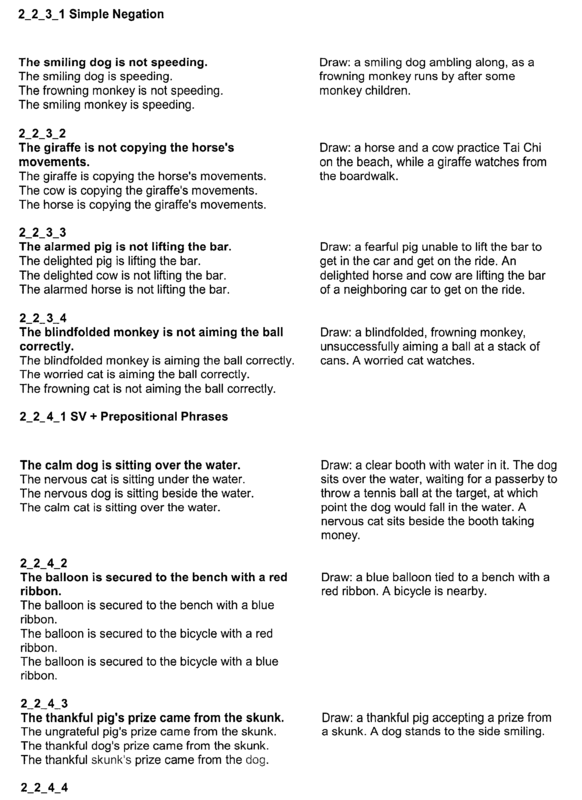 At decision block  4236, a determination is made as to whether there are any more question types for the present paragraph. 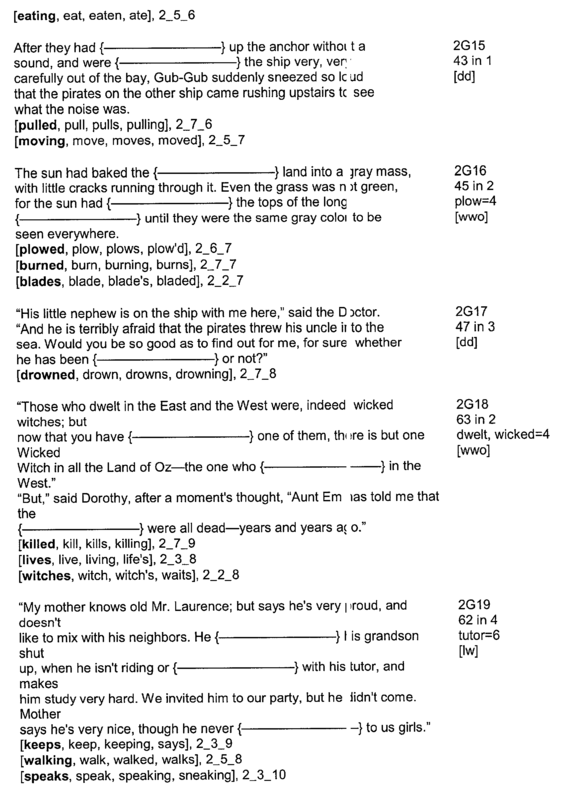 If so, then flow proceeds back to block 4210 where the paragraph is again presented, and the above described sequence continues until all questions for all question types, at the present level, for the present paragraph, have been presented. If there are no more question types for the present paragraph, flow proceeds to decision block 4238. 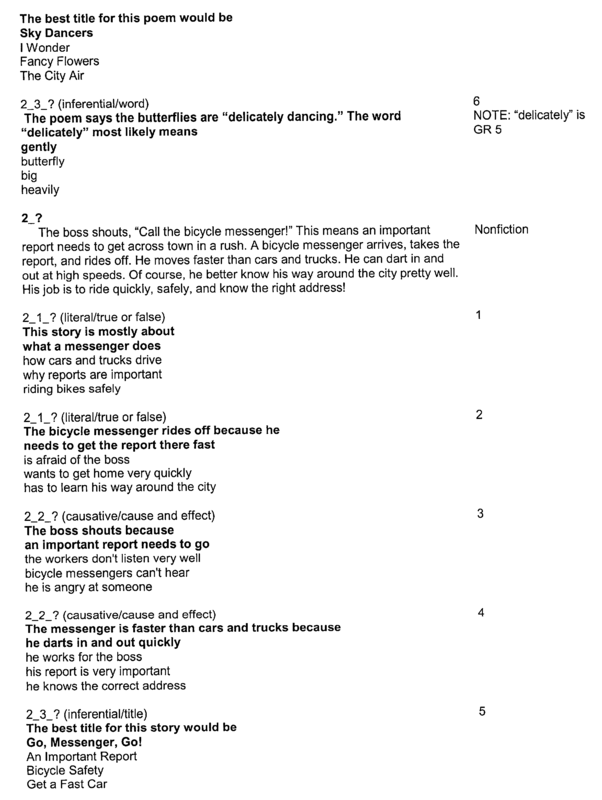 At decision block  4238, a determination is made as to whether the student correctly answered all the questions for all the question types for the present paragraph, on the first attempt. If not, flow proceeds to block 4244. Otherwise, flow proceeds to block 4242. At block  4244, the present paragraph is again repeated. Flow then proceeds to block 4246. At block  4246, all of the questions that were incorrectly answered on the 1st attempt, for all of the question types, are repeated, one at a time, to allow the student to correctly answer the questions. The student is given two opportunities to answer each outstanding question correctly. As mentioned above, previous incorrect answers are grayed out and deactivated to give the student a better opportunity to answer correctly. Whether or not the student answers the outstanding questions correctly, after two attempt, flow proceeds to block 4242. At block  4242, the present paragraph is marked complete. Flow then proceeds to decision block 4240. 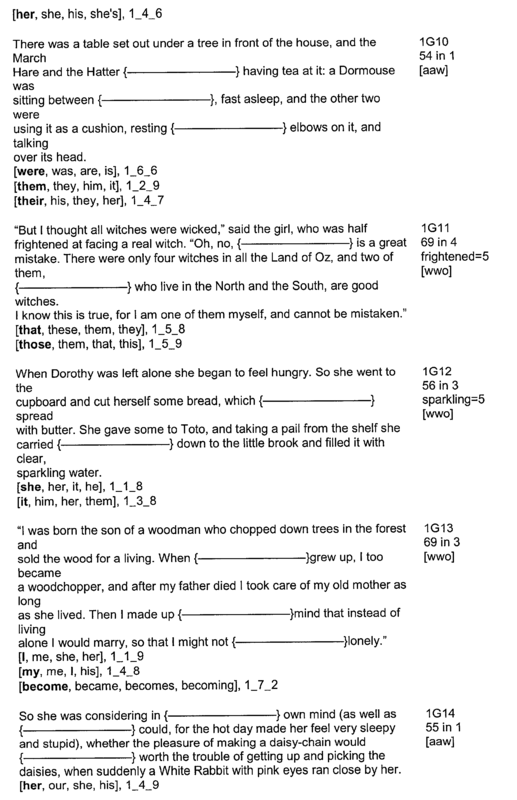 At decision block  4240, a determination is made as to whether all of the paragraphs for the present level have been completed. If not, flow proceeds back to block 4208 where a new paragraph is selected for presentation. However, if all paragraphs at the present level have been completed, flow proceeds to decision block 4248. 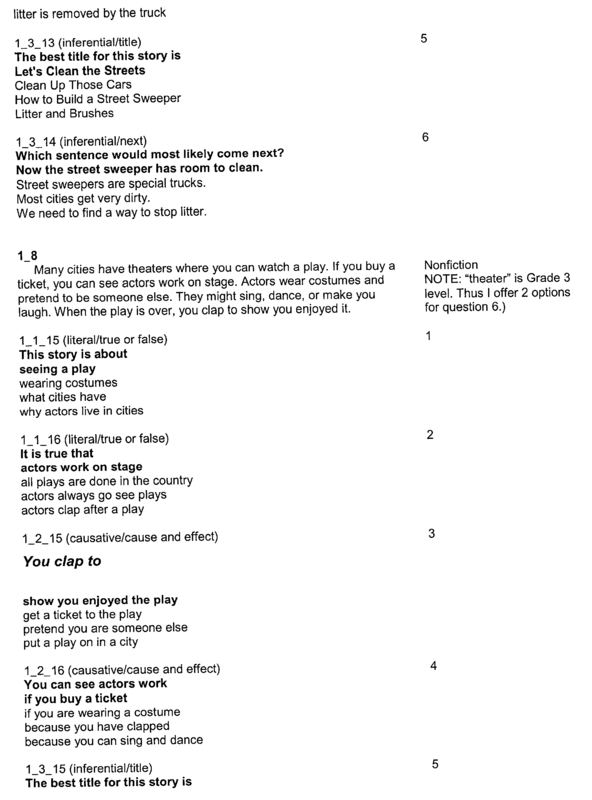 At decision block  4248, a determination is made as to whether the student correctly answered at least 95% of the questions, for all question types, for all paragraphs, at the present level. If not, then flow proceeds to block 4250. Otherwise, flow proceeds to decision block 4252. 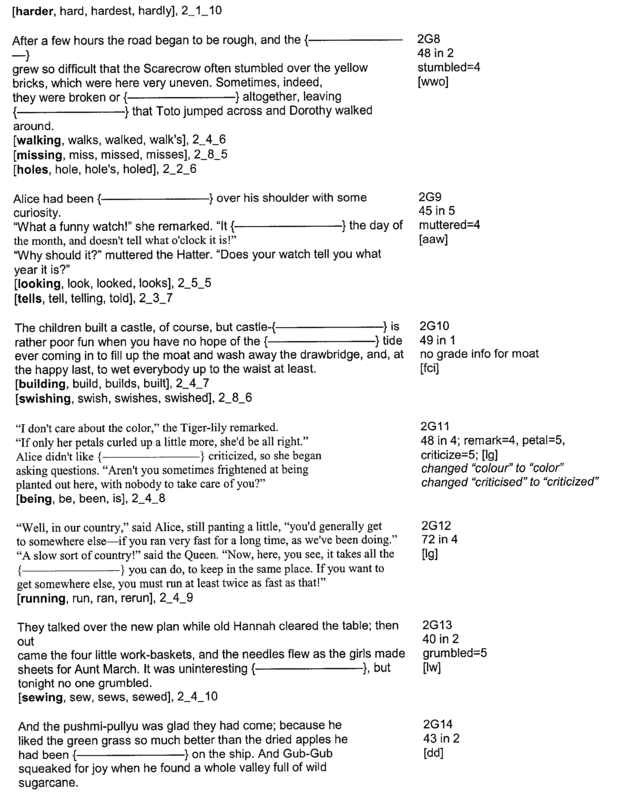 At block  4250, all questions, question types, and paragraphs are reset, and flow proceeds back to block 4208 to train again, as described above. The student will continue in this training process until s/he has achieved a 95% success rate across all paragraphs, on the 1st attempt. At decision block  4252, a determination is made as to whether there are any more levels for training. If not, flow proceeds to block 4254 where training on Book Monkeys ends. However, if there are more levels of training, flow proceeds to block 4256. At block  4256, the training level is increased. For example, if the student correctly passes 95% of the questions for level 1, the training level is incremented to level 2. Flow then proceeds back to block 4208 where training begins with new paragraphs for the new training level. 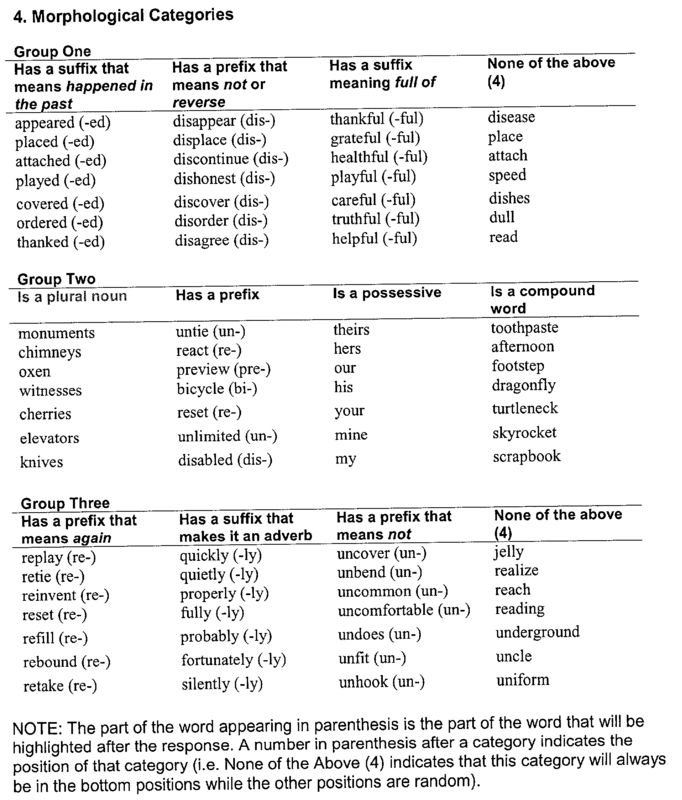 Vocabulary: Hog Hat Zone trains students to recognize and correctly use morphological affixes-prefixes and suffixes. 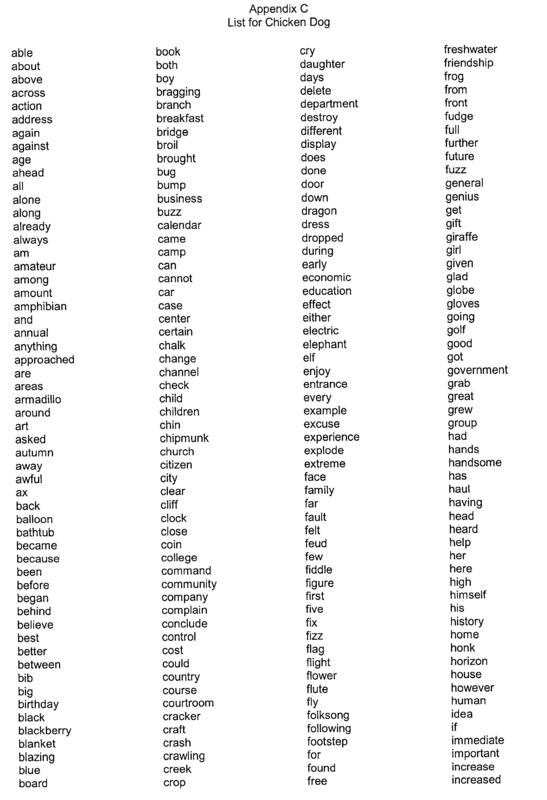 Because comprehension of morphological changes leads to vocabulary growth in 3 rd grade and beyond, Hog Hat Zone helps students increase their vocabulary skills. Referring now to FIG. 43, an initial screen shot  4300 is shown for the game Hog Hat Zone. As in the other games described above, the screen contains a yellow paw 4302 for initiating a trial, a score counter 4304, and a timer 4306 to indicate a relative amount of remaining time. The setting for Hog Hat Zone is that of a construction site. Either steel pipes, or beams, are provided which are not connected to each other. Additional lengths of pipe 4310 are provided that are to be inserted on the pipes 4308 to complete the construction. When the student selects the yellow paw 4302, s/he is taken to the screen 4400 of FIG. 44, to which attention is now directed. On top of the pipes  4408 are placed a sentence or two that is missing a key word or words. The additional lengths of pipes 4410 are provided with four words which may be selected for insertion into the first break in the pipes 4408. One of these words is the correct word, and the other three are foils. 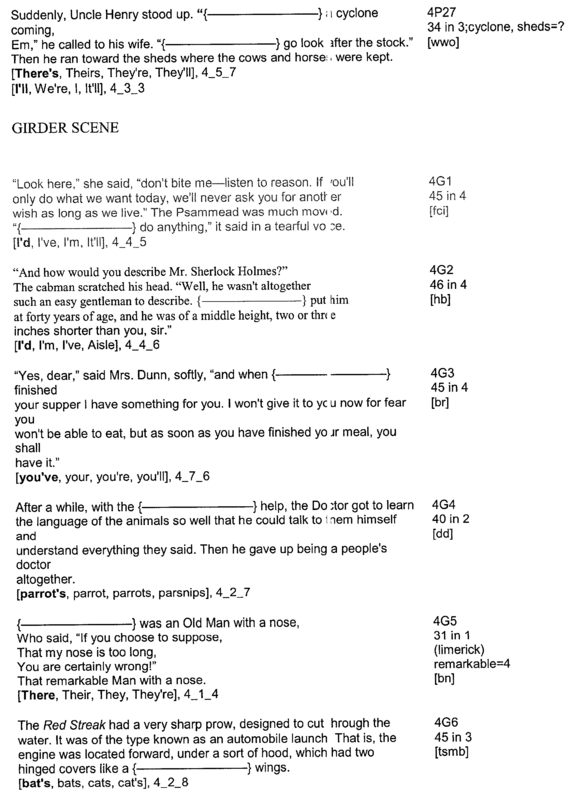 If the student selects the correct word, in this case, the word “her”, a “ding” is played to indicate the correct selection, and the student is presented with screen 4500 of FIG. 45, to which attention is now directed. The first word “her”  4512 that was selected, has been inserted into the pipe 4508 to complete the pipe. Since there is still a break in another pipe, the student must select the next correct word. 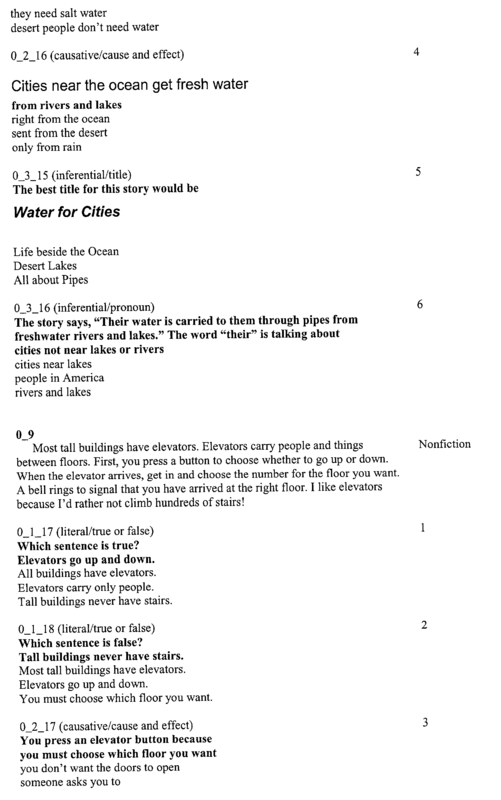 If the student selects an incorrect word, a “thunk” is played to indicate an incorrect selection, and the correct word is highlighted and placed on the pipe 4508. Referring now to FIG. 46, a screen shot  4600 is shown illustrating a slightly more advanced trial. The length of the reading, along with the complexity of the trial has increased. 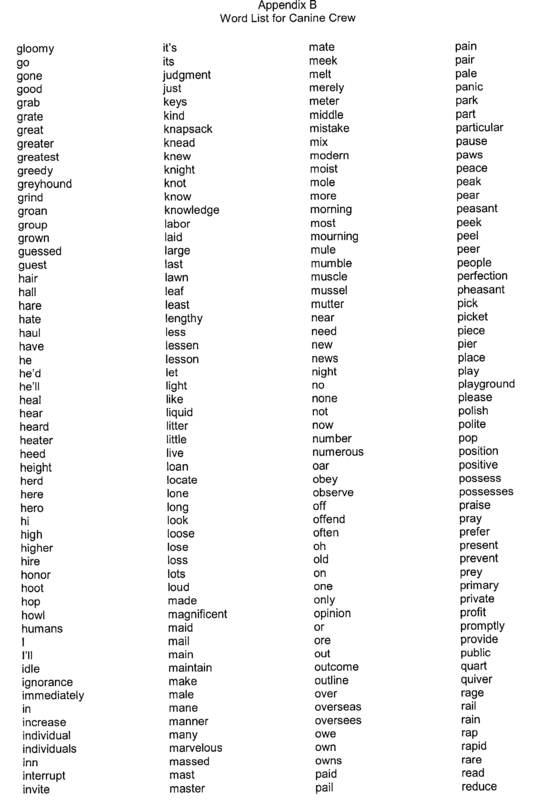 However, the method of Hog Hat Zone is still the same: the student must complete construction of the pipe by selecting the correct word. Referring now to FIGS. 47 a-b, a flow chart 4700 is provided illustrating the training and advancement methodology for the game Hog Hat Zone. Flow begins at block 4702 and proceeds to decision block 4704. Play remains at decision block  4704 until the student selects the yellow paw to initiate a trial. Once the student selects the yellow paw, flow proceeds to block 4706. At block  4706, the Tier and Unit levels are set to 1. Flow then proceeds to block 4708. 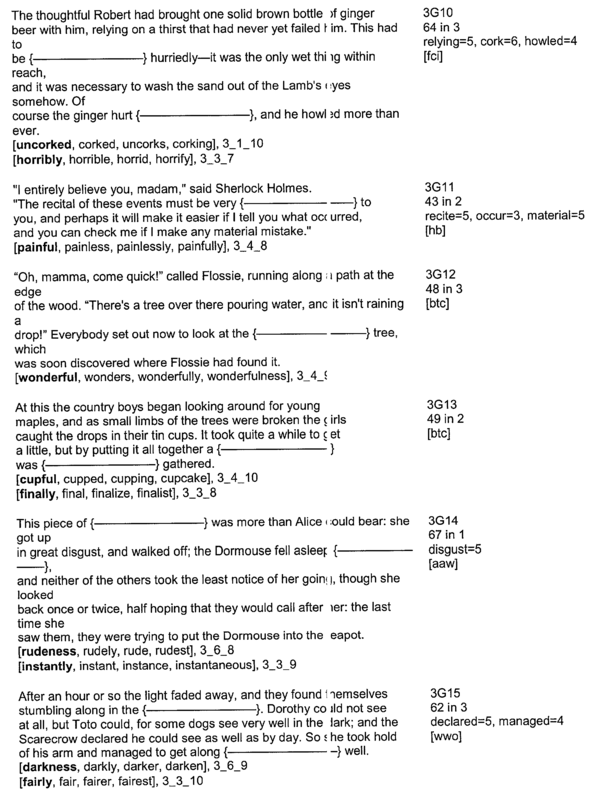 At block  4708, the program randomly selects a paragraph from the remaining paragraphs within the present tier and present unit. 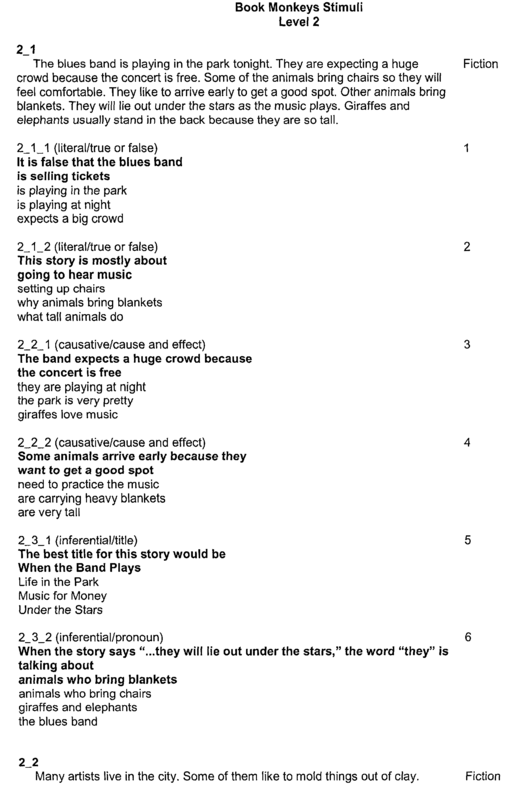 Initially, the unit and tier are at level 1, and all paragraphs are available for selection. 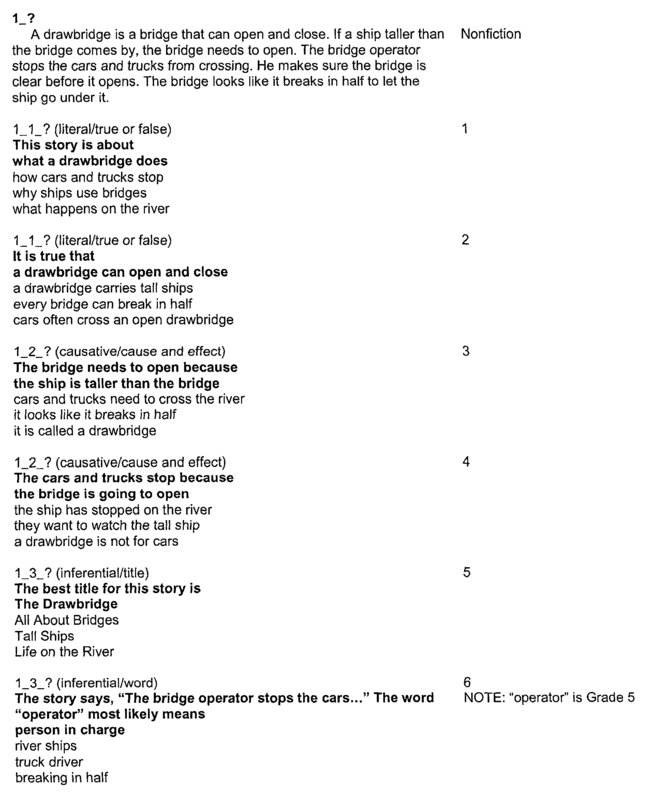 However, as the student progresses through the game, block 4708 chooses remaining paragraphs from the existing tier and unit levels. Flow then proceeds to block 4710. At block  4710, the present (selected) paragraph is presented to the student as a trial. Flow then proceeds to decision block 4712. At decision block  4712, a determination is made as to whether the student's selection was correct. If not, flow proceeds to block 4714. Otherwise, flow proceeds to block 4716. At block  4714, a “thunk” is played to alert the student of the incorrect answer, the incorrect response is recorded, and the correct answer is inserted into the pipe (if unit 1) or girder (if unit 2). Flow then proceeds to decision block 4718. At block  4716, a “ding” is played to alert the student of the correct answer, the correct response is recorded, and the correct answer is inserted into the pipe/girder. Flow then proceeds to decision block 4718. At decision block  4718, a determination is made as to whether another trial is outstanding for the present paragraph. If not, flow proceeds to decision block 4720. However, if another trial is outstanding, flow proceeds back to decision block 4712 to evaluate the trial. At decision block  4720, a determination is made as to whether there is another paragraph within the present unit. If so, flow proceeds back to block 4708 where another one of the remaining paragraphs is chosen for a trial. Otherwise, all paragraphs for the present unit have been completed, and flow proceeds to decision block 4722. At decision block  4722, a determination is made as to whether the present unit is unit 2. That is, have all paragraphs for both units been presented? If not, then flow proceeds to block 4724. Otherwise, flow proceeds to decision block 4726. At block  4724 the present unit is incremented. That is, unit 1 is incremented to unit 2. Flow then proceeds back to block 4708 where the program selects a paragraph from the present unit/tier. At decision block  4726, a determination is made as to whether the student correctly responded to 90% of the trials in unit 1. If not, flow proceeds to block 4730. Otherwise, flow proceeds to decision block 4732. At block  4730, the fact that the student did not achieve 90& correct responses in unit 1 is recorded. Flow then proceeds to decision block 4732. At decision block  4732, a determination is made as to whether the student correctly responded to 90% of the trials in unit 2. If not, flow proceeds to block 4736. Otherwise, flow proceeds to decision block 4734. At block  4736, the fact that the student did not achieve 90& correct responses in unit 2 is recorded. Flow then proceeds to decision block 4738. At decision block  4738, a determination is made as to whether either/both of units 1 and 2 have been repeated 3 times. If not, flow proceeds to block 4744. Otherwise, flow proceeds to block 4746. At block  4744, the units that have been recorded to be repeated (in blocks 4730/4736 are repeated per the sequence described above. That is, a student must achieve a 90% correct response in both units before they are allowed to proceed to the next tier. After the recorded units are repeated, flow proceeds back to decision block 4726 to determine if the student has obtained a 90% correct response. This process continues until either: 1) a 90% correct response is obtained in both units, at the present tier level; or 2) the student has repeated either or both the units 3 times. If the student repeats the unit 3 times, flow proceeds to block 4746 (as mentioned above). At block  4746, the units that were repeated three times, but unsuccessfully, are marked to remain open. Flow then proceeds to block 4728. At block  4728 the present tier is incremented. That is, if the present tier is 1, the tier is incremented to level 2. Flow then proceeds back to block 4708 where a new paragraph is selected, beginning at unit 1, for the new tier level. When the program arrives at decision block  4734, it is because the student has obtained a 90% correct response for both units at the present tier level. A determination is then made as to whether the present tier level is the last tier. If it is, flow proceeds to block 4740. However, if it is not the last tier level, flow proceeds to block 4728 where the present tier level is incremented, and the training begins again as described above. At block  4740, all open units are completed. That is, all of the units that were attempted three times, and not completed with a 90% correct response, were marked open in block 4746, and must be completed before the game ends. Game play continues on the open units until a 90% correct response is obtained. Flow then proceeds to block 4742 where training in Hog Hat Zone ends. f) repeating steps c) through e). 3. The method as recited in claim 2 wherein the plurality of category types comprise: Semantic; Syntactic; Phonological; and Morphological. 4. 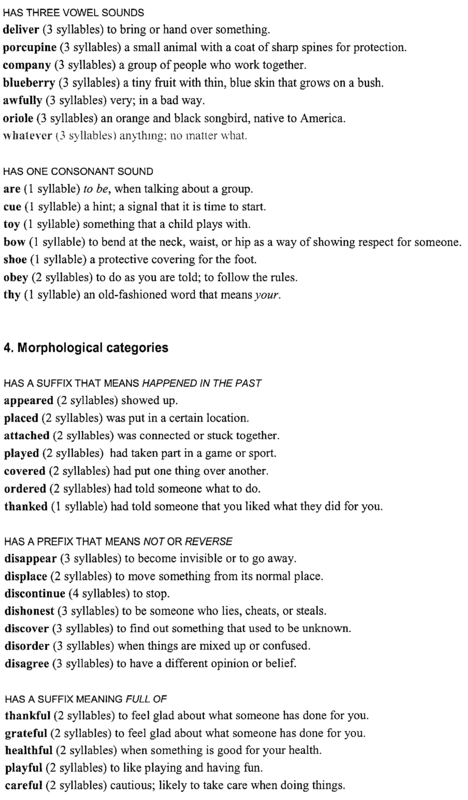 The method as recited in claim 1 wherein the plurality of categories within a syntactic category type comprises: nouns; verbs; adjectives; and prepositions. 5. 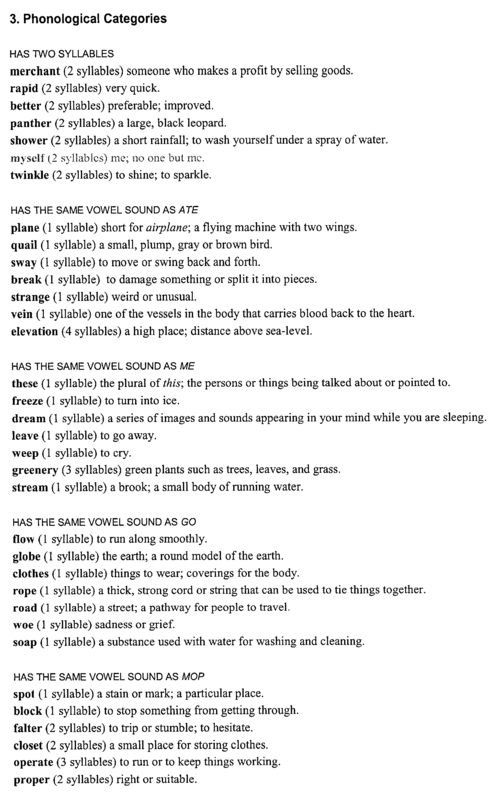 The method as recited in claim 1 wherein the plurality of categories within a phonological category type comprises: has two syllables; has the same vowel sound as ate; has the “s” sound; and has one consonant sound. 6. 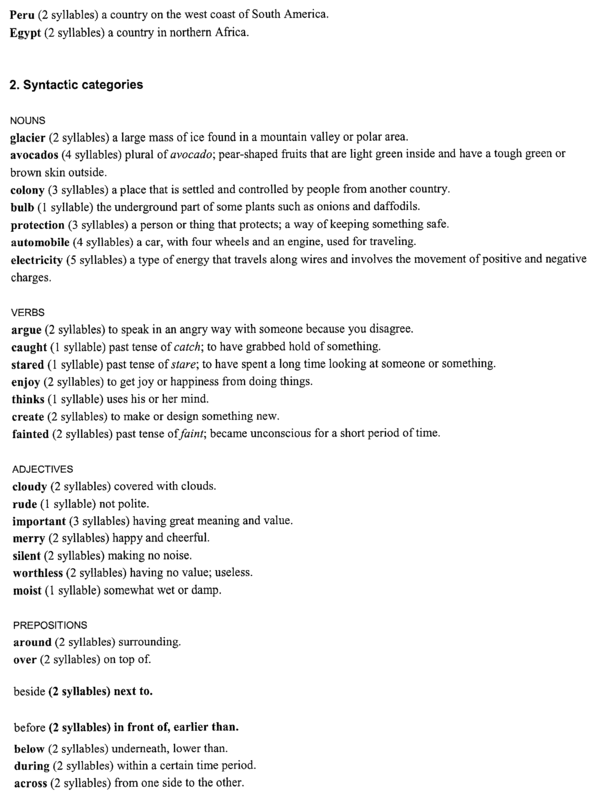 The method as recited in claim 1 wherein the plurality of categories within a morphological category type comprises: is a plural noun; is a possessive; is a compound word; a nd has a suffix that means happened in the past. 7. 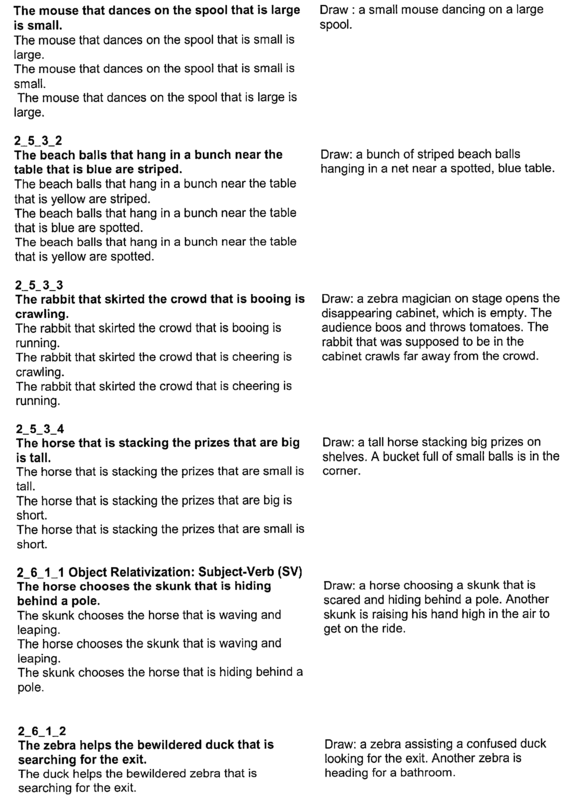 The method as recited in claim 1 wherein the graphical setting of step b) comprises an animated story that illustrates the process of categorization or sorting. c2) providing a second help box which, when selected by the student, aurally presents the one of the plurality of words to the student, via the computing device. 9. 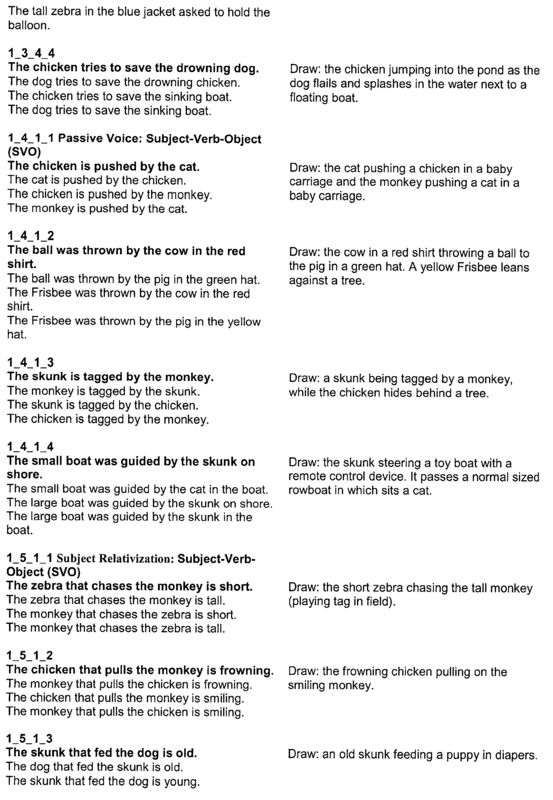 The method as recited in claim 1 wherein said step d) of indicating a selection of one of the two or more of the presented categories comprises: mouse clicking on the selected one of the two or more of the presented categories. 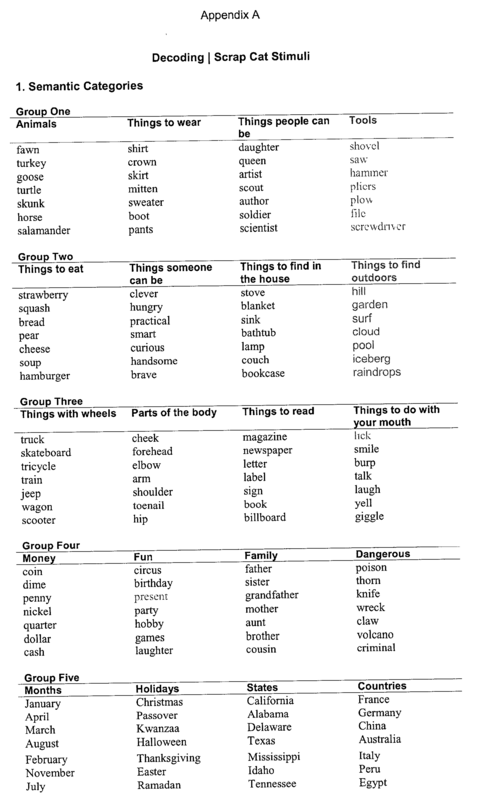 d2) if the student incorrectly categorized the presented one of the plurality of words, visually indicating what should have been the correct categorization. 11. 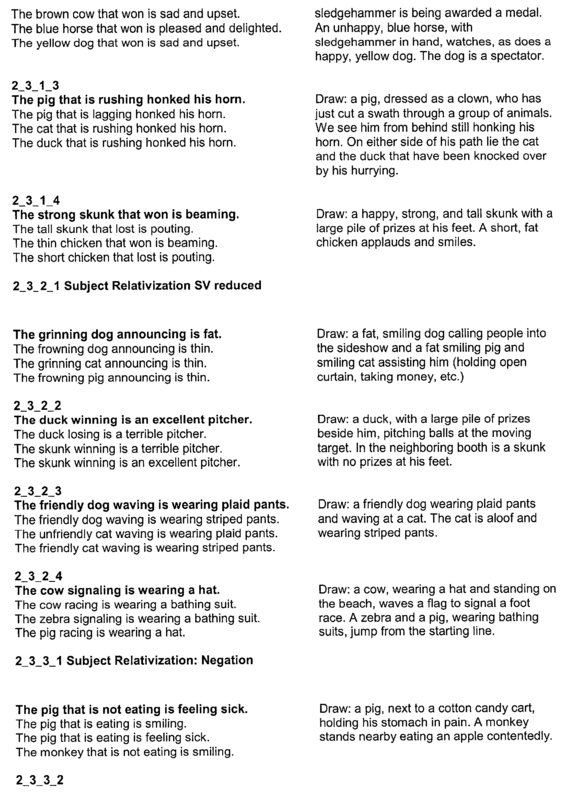 The method as recited in claim 10 wherein said step d2) comprises: visually highlighting the correct one of the two or more of the presented categories for the presented one of the plurality of words. 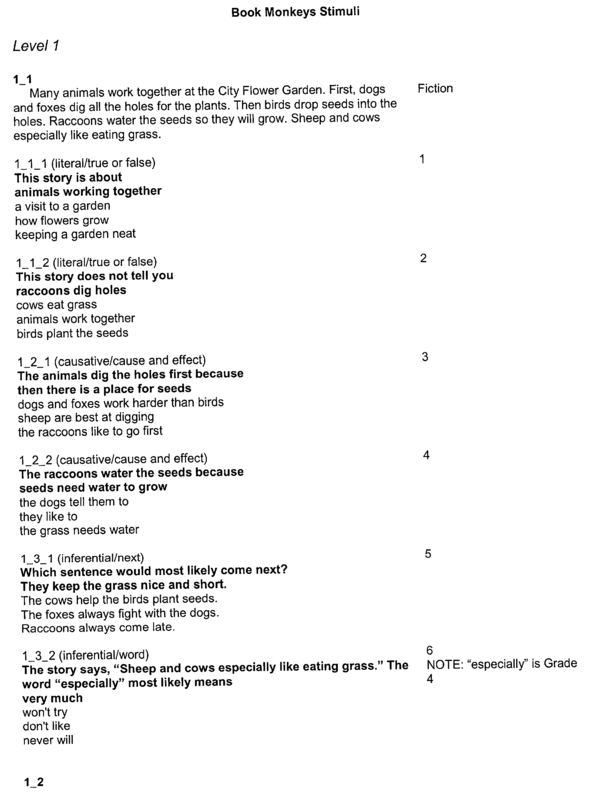 g) after a predetermined number of trials (repeating steps c) through e)), determining if the student has correctly categorized presented words, for at least 90% of the trials. h1) if the student has correctly categorized the presented words for at least 90% of the trials, providing alternate ones of the plurality of categories in step a) for further training. 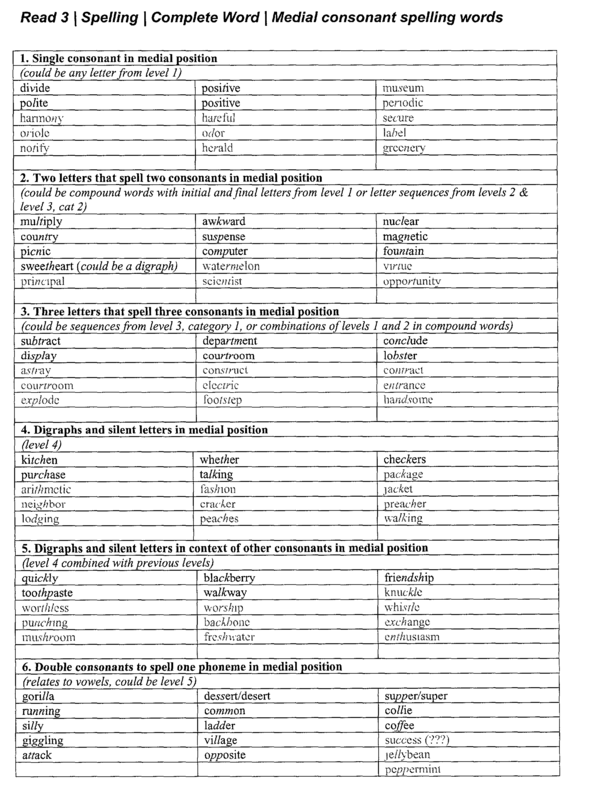 h2) if the student has correctly categorized the presented words for at least 90% of the trials, increasing the number of the categories presented in step b) to three or more. h3) if the student has correctly categorized a predetermined percentage of words for all of the plurality of categories, providing additional categories of a different type to training. f) after the student has correctly categorized a predetermined percentage of the plurality of words, selecting a second one of the plurality of category types for continued training. 17. 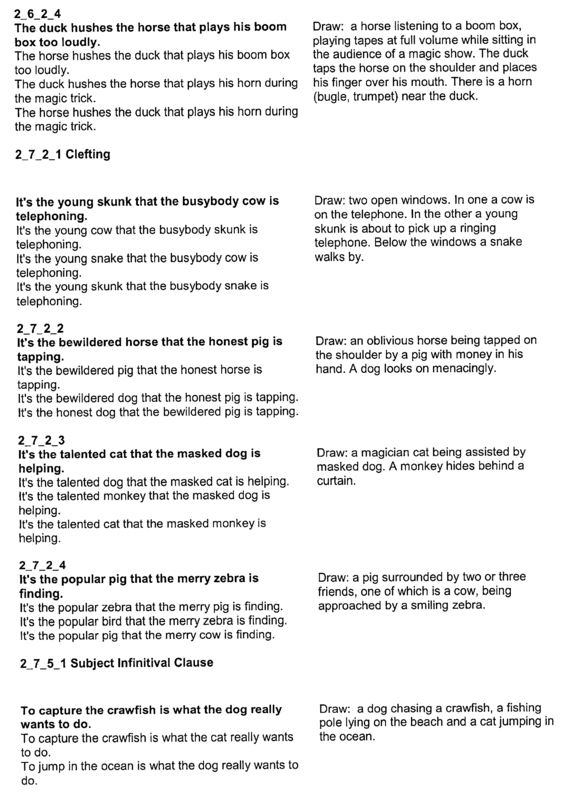 The method as recited in claim 16 wherein the category types comprise: Semantic; Syntactic; Phonological; and Morphological. 18. 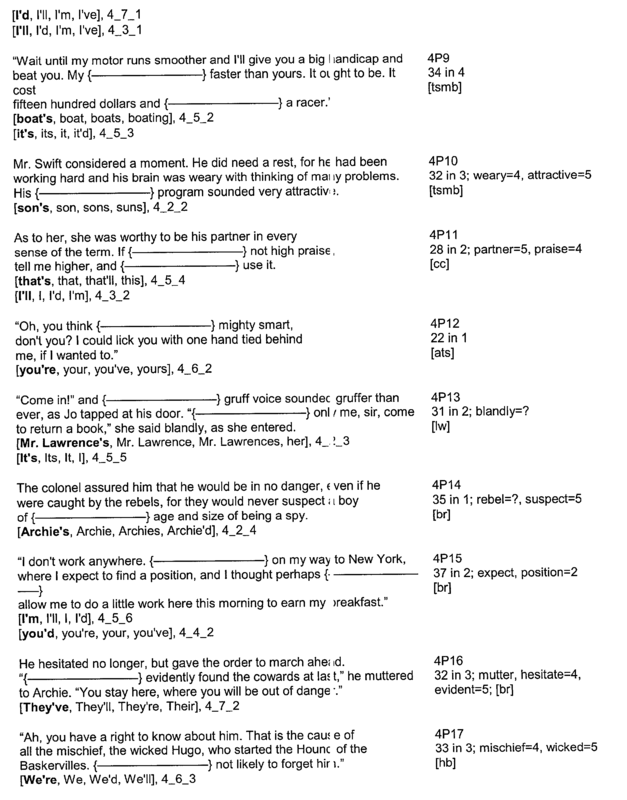 The method as recited in claim 16 wherein the first one of the plurality of category types is Semantic. 19. The method as recited in claim 16 wherein said steps b) through c) are presented by providing an animation scene on a display of the computing device. 20. 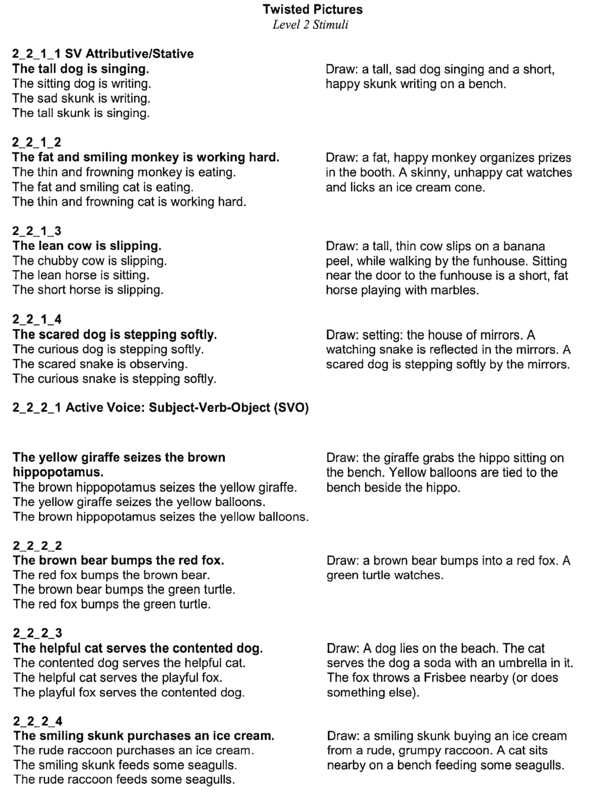 The method as recited in claim 16 wherein the student is cross-trained by being training to categorize a number of words in different category types including semantic, syntactic, phonological and morphological categories. d) after the student has correctly categorized a predetermined percentage of the words for a first category type, changing the category type for training to a second category type and repeating steps b) through c). 22. 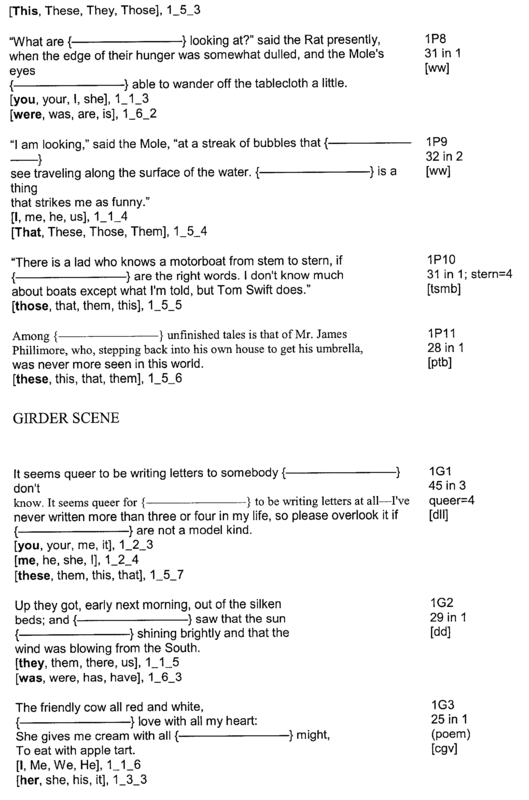 The method as recited in claim 21 wherein the computing device comprises a personal computer having an input device such as a mouse, a display for presentation of the animated scene, and speakers. 23. 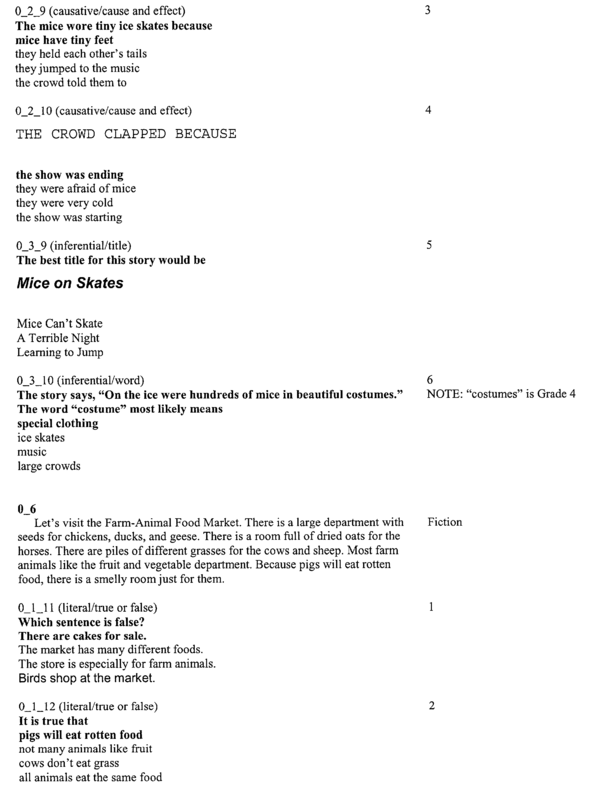 The method as recited in claim 21 wherein the animated scene representative of a sorting process provides an entertaining backdrop illustrative of sorting items into particular categories or bins. b1) after the student has correctly categorized a second predetermined percentage of the words for the presented two or more of the plurality of categories, increasing the number of the plurality of categories that are presented to the student as possible selections for sorting words. 25. The method as recited in claim 24 wherein if the number of presented categories in said step b) is initially two, then said step b1) increases the number of presented categories to three. 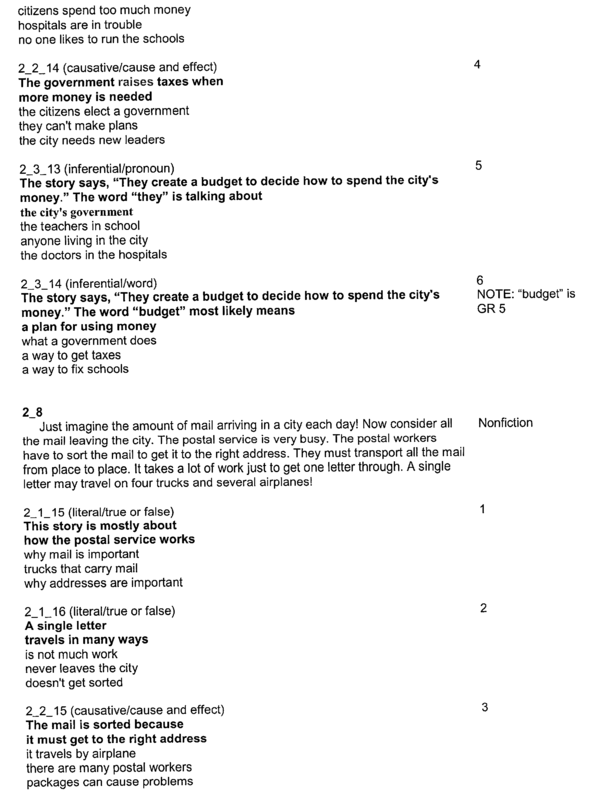 c1) if the student requests clarification of the visually presented words, providing a definition box containing a written definition of the visually presented words. c2) if the student requests further clarification of the visually presented words, auditorily presenting the visually presented words. b1) if the student requests clarification of the presented two or more of the plurality of categories, auditorily presenting the two or more of the plurality of categories. 29. The method as recited in claim 21 wherein in said step c) the presented words are visually presented to the student, one at a time. CH663102A5 (en) * 1984-12-21 1987-11-13 Conzelmann Flachglas Glass pane arrangement with disc break-register device. Lindsey et al. 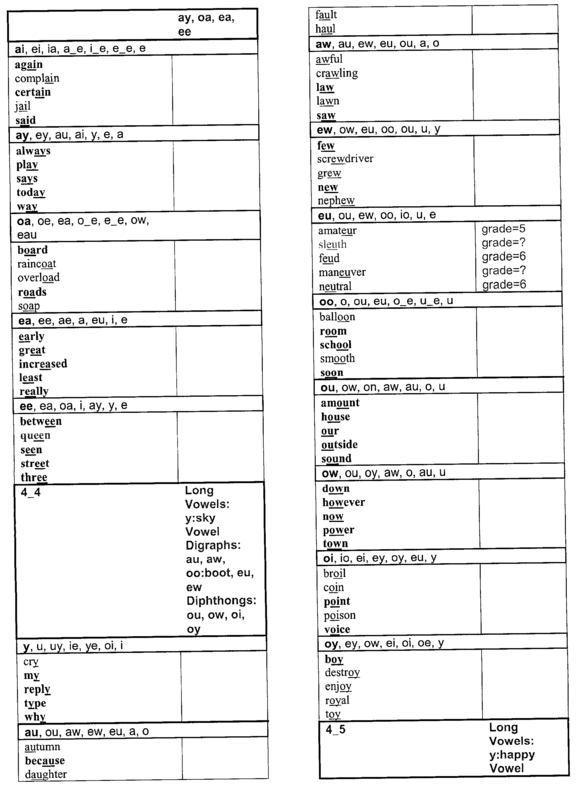 2003 Prediction of first-grade reading in Spanish-speaking English-language learners. Kuhn et al. 2003 Fluency: A review of developmental and remedial practices.